The present invention is a multi-phased personal care composition that contains at least two visually distinct phases. At least one visually distinct phase contains a cleansing phase and at least one visually distinct phase contains a colorant. The colorant is substantially free of Barium and/or Aluminum. The phases are packaged in physical contact with one another. 本发明涉及一种多相个人护理组合物，所述组合物包含至少两个视觉上不同的相。  The present invention relates to a multiphase personal care composition, said composition comprising at least two visually distinct phases. 至少一个视觉上不同的相包含清洁相，并且至少一个视觉上不同的相包含着色剂，其中所述着色剂基本上不含钡和/或铝。 At least one visually distinct phase comprises a cleansing phase, and at least one visually distinct phase comprises a colorant, wherein the colorant is substantially free of barium and / or aluminum. 所述相以彼此直接接触的方式包装。 Said phase in direct contact with each other packaging. 个人护理组合物在美国以及世界各地正越来越普及。  Personal care compositions are becoming more popular in the United States and around the world. 个人护理组合物是熟知的并且被广泛地使用。 Personal care compositions are well known and widely used. 理想的个人护理组合物必须满足许多标准。 Desirable personal care composition must meet a number of criteria. 例如，为了能够被消费者接受，个人护理组合物必须显示具有良好的清洁性质，必须显示具有良好的起泡特性，必须对皮肤温和（不会引起干燥或刺激），并且优选应该向皮肤提供调理有益效果。 For example, in order to be acceptable to consumers, a personal care composition must exhibit good cleaning properties, must exhibit good lathering characteristics, must be mild to the skin (not cause drying or irritation) and preferably should provide conditioning to the skin benefits. 个人护理组合物还被用于改变皮肤的颜色和外观。 Personal care compositions have also been used to alter the color and appearance of the skin. 试图与其它结合起泡表面活性剂的类似物质一起提供皮肤调理有益效果的个人护理组合物是熟知的。  attempt to provide skin conditioning benefits in combination with other similar materials lathering surfactant personal care compositions are well known. 尽管这些产品同时提供调理和清洁有益效果，但是通常难以配制包含彼此直接接触但同时视觉上不同且稳定的清洁组合物和调理组合物的产品。 Although these products while providing conditioning and cleansing benefits, it is generally difficult to formulate in direct contact with each other but comprise a visually distinct product, and stable cleaning compositions and conditioning compositions. 由单一的个人清洁产品提供调理和清洁有益效果同时保持稳定的一种尝试是使用双室包装。 An attempt to  provide conditioning and cleansing benefits from a single personal cleansing products while maintaining stability is the use of dual-chamber packaging. 这些包装包含分离的清洁组合物和调理组合物，并且使这两者在一种流体或两种流体中共分配。 These packages comprise separate cleansing compositions and conditioning compositions, and the co-dispensing of the two in one fluid or two fluids. 因此，分离的组合物在长期存储期间和即将施用之前保持在实体分离和稳定状态，但接着在分配时或分配后混合，以由物理稳定的体系提供调理和清洁有益效果。 Thus, an isolated composition is maintained during long-term storage prior to administration and at steady state and physically separate, but followed by mixing, to provide a physically stable conditioning systems and cleansing benefits during dispensing or after dispensing. 虽然与使用常规体系相比，上述双室递送体系可提供改善的调理有益效果，但通常难以达到一致和均勻的性能，这是因为来自这些双室包装的清洁相和调理相之间分配比不均勻。 Although compared with conventional systems, the above-described dual-chamber delivery systems provide improved conditioning benefits, it is often difficult to achieve consistent and uniform performance because the distribution ratio between the cleansing phase and the conditioning without phase from these dual-chamber packages uniform. 因此，仍需要包含至少两个直接接触的视觉上不同相的多相个人护理组合物，所述组合物可长期保持稳定，同时所述两个视觉上不同的相保持图案并还能够向使用者的皮肤有效沉积调理有益效果。  Thus, there remains a need multiphase personal care composition comprising different phases of the at least two visually direct contact with, the compositions can be long-term stability, while the two visually distinct phases is also possible to hold the patterning and effective deposition to the user's skin conditioning benefits. 因此，本发明的一个目标是提供包含至少两个视觉上不同相的多相个人护理组合物。  Accordingly, an object of the present invention to provide a multiphase personal care composition comprising different phases of at least two visually. 至少一个视觉上不同的相包含清洁相，并且至少一个视觉上不同的相包含着色剂，其中所述着色剂基本上不含钡和/或铝。 At least one visually distinct phase comprises a cleansing phase, and at least one visually distinct phase comprises a colorant, wherein the colorant is substantially free of barium and / or aluminum. 所述相以彼此直接接触的方式包装。 Said phase in direct contact with each other packaging. 使用基本上不含钡和/或铝的着色剂提供了改善的清洁相稳定性，以使所述清洁相可与包含高含量有益组分的第二视觉上不同相组合。 Using essentially free of barium and / or aluminum colorant cleansing phase provides improved stability, so that the cleansing phase composition may comprise a second phase with high levels of benefit components visually. 这使得在保持所述组合物稳定性的同时可以更高的量沉积有益组分。 This allows the composition while maintaining the stability of the deposition may be higher amounts benefit components. 本发明涉及一种多相个人护理组合物，所述组合物包含：至少两个视觉上不同的相；其中至少一个视觉上不同的相包含清洁相；并且其中至少一个视觉上不同的相包含着色剂，其中所述着色剂基本上不含钡和/或铝；并且其中所述相以彼此直接接触的方式包装。  The present invention relates to a multiphase personal care composition, said composition comprising: at least two visually distinct phases; wherein at least one visually distinct phase comprises a cleansing phase; and wherein the at least one visually distinct phase comprises a colorant, wherein the colorant is substantially free of barium and / or aluminum; and wherein said phase in direct contact with each other packaging. 本发明还涉及一种多相个人护理组合物，所述组合物包含：至少两个视觉上不同的相；其中至少一个视觉上不同的相包含清洁相，所述清洁相包含：a)表面活性剂组分，所述表面活性剂组分包含：i)至少一种非离子表面活性剂，所述非离子表面活性剂具有的HLB为约3. 4至约15. O ；ii)至少一种阴离子表面活性剂；iii)至少一种两性表面活性剂； b)电解质；并且其中至少一个视觉上不同的相包含有益相；并且其中至少一个视觉上不同的相包含着色剂，其中所述着色剂基本上不含钡和/或铝；并且其中所述相以彼此直接接触的方式包装。  The present invention further relates to a multiphase personal care composition, said composition comprising: at least two visually distinct phases; wherein the at least one visually distinct phase comprises a cleansing phase, a cleansing phase comprising: a ) surfactant component, the surfactant component comprising: i) at least one nonionic surfactant, the nonionic surfactant having an HLB of from about 3.4 to about 15. O; ii) at least one anionic surfactant; iii) at least one amphoteric surfactant; b) an electrolyte; and wherein at least one visually distinct phase comprises a benefit phase; and wherein at least one visually distinct phase comprises a colorant, wherein said colorant is substantially free of barium and / or aluminum; and wherein said phase in direct contact with each other packaging. 本发明还涉及通过将如上所述的组合物涂敷到皮肤上来清洁、保湿和递送皮肤有益剂至皮肤的方法。  The present invention further relates to a composition as described above by applying to the skin cleansing, moisturizing and delivering skin benefit agents to the skin method. 本发明的多相个人护理组合物包含至少两个视觉上不同的相；其中至少一个视觉上不同的相包含清洁相；并且其中至少一个视觉上不同的相包含着色剂，其中所述着色剂基本上不含钡和/或铝；并且其中所述相以彼此直接接触的方式包装。  The multiphase personal care compositions of the present invention comprises at least two visually distinct phases; wherein at least one visually distinct phase comprises a cleansing phase; and wherein at least one visually distinct phase comprises a colorant, wherein said a colorant substantially free of barium and / or aluminum; and wherein said phase in direct contact with each other packaging. 所述组合物的这些和其它基本限定条件和本发明的方法以及适用于本文的许多任选成分将在下文详细描述。  These and other methods of the essential limitations of the present invention and many of the optional ingredients of compositions suitable for use herein will be described in detail below. 除非另外指明，本文所用术语“无水”涉及那些包含按重量计小于约10%，更优选小于约5%，甚至更优选小于约3%，甚至更优选0%的水的组合物或物质。  Unless otherwise indicated, as used herein, the term "dry" refers to those by weight, less than about 10%, more preferably less than about 5%, even more preferably less than about 3%, even more preferably 0% of the aqueous composition comprising or substances. 本文所用术语“环境条件”是指在101. 325kPa(— (1)个大气压)压力、50%相对湿度和25 °C时的环境条件。  As used herein, the term "ambient conditions" means 101. 325kPa (- (1) atm) pressure, 50% relative humidity, and at 25 ° C.
 本文所用术语“美容有效量”是由所述组合物的使用而可赋予有益效果的量。  As used herein, the term "cosmetically effective amount" is an amount of use of the composition and impart a beneficial effect. 本文所用术语“域”是指包含分子混合物的物质、组分、组合物或相的体积，其可被浓缩，但不能被物理力如超速离心进一步分离。  As used herein, the term "domain" refers to the volume of material comprising a molecular mixture, component, composition or phase, which can be concentrated but not physical forces such as ultracentrifugation further separated. 例如，表面活性剂层，表面活性剂胶束，表面活性剂晶体，油，蜡，水-甘油混合物，水合亲水性聚合物，所有可被浓缩并可通过超速离心观察到的、但无法通过相同力进一步分离成截然不同分子组分的所有连续域。 For example, surfactant lamellar, surfactant micellar, surfactant crystal, oil, wax, water - glycerine mixture, hydrated hydrophilic polymer all can be concentrated and observed by ultracentrifugation, but not by All the same force is further separated into distinct molecular components continuous domain. 本文所用术语“疏水改性的干涉颜料”或“HMIP”是指部分干涉颜料的表面已用疏水材料涂敷，包括分子的物理和化学粘合。  As used herein, the term "hydrophobically modified interference pigment" or "the HMIP" refers to the portion of the interference pigment surface has been coated with a hydrophobic material, including both physical and chemical bonding of molecules. 本文所用术语“干涉颜料”是指通过用薄膜涂敷颗粒基质材料表面（通常为小片状）制备的珠光色颜料。  As used herein, the term "interference pigment" refers to a surface of the substrate film coated pearlescent pigment particles (generally platelet in shape) prepared by. 薄膜是具有高折射率的透明或半透明材料。 Film having a high refractive index transparent or translucent material. 较高折射率材料显示具有珠光色，这是由从小片状基质/涂层界面反射的入射光和从涂层表面反射的入射光之间的相互干涉作用产生的。 A higher refractive index material shows a pearl gloss, which is produced by the action of mutual interference between the small sheet-shaped substrate / coating layer interface and reflection of incident light reflected from the coated surface of incident light. 本文所用术语“多相的”和“多相”是指本文中的至少两相在储存它们的包装中占据独立且不同的实际空间，但是彼此直接接触（即，它们未被隔层分隔，而且它们没有任何显著程度地乳化或混合）。  As used herein, the term "heterogeneous" and "multi-phase" as used herein, refers to at least two phases in the storage package in which they occupy separate but distinct physical spaces, but in direct contact with each other (i.e., they are not barrier separated, and they do not to any significant extent emulsified or mixed). 在本发明的一个优选实施方案中，包含至少两相的“多相，，个人护理组合物以视觉上不同的图案存在于容器中。所述图案得自所述相的共混，该共混没有将任一相混入或均化入另一相，以致两个相都不是连续的。这些图案包括但不限于以下例子：条纹状、大理石纹状、直线、间歇式条纹状、方格状、斑驳状、叶脉状、束丛状、斑点状、几何状、斑纹状、带状、螺旋状、漩涡状、阵列状、杂色小块状、织纹状、沟槽状、隆起状、波纹状、 正弦曲线状、螺线状、卷曲状、弯曲状、环状、条痕状、线纹状、轮廓状、各向相异状、带花边状、编织或织造状、编篮状、斑纹状和棋盘格状。所述图案优选选自条纹状、几何状、大理石纹状以及它们的组合。 In a preferred embodiment of the present invention, comprising at least two phases ",, multiphase personal care compositions of the different visual patterns present in the vessel. The pattern obtained from the phase blend, the blend did not any phase mixed into another phase or a homogenizer, such that two phases are not continuous but are not limited to such patterns include the following examples: striped, marbled, rectilinear, interrupted striped, checkered, mottled, vein-shaped, plexiform beam, speckled, geometric, spotted, ribbons, helical, swirl, arrayed, variegated, textured, groove-like, ridge-like, corrugated , sinusoidal, spiral, twisted, curved, ring, streaks, striated, contoured, the abnormal phase, laced, weave or woven, basket weave, spotted and tessellated. preferably the pattern is selected from striped, geometric, marbled, and combinations thereof. 在一个优选的实施方案中，条纹状图案在整个包装范围内是较一致和均勻的。  In a preferred embodiment, the striped pattern is more consistent and uniform over the entire dimension of the package. 可供选择地，条纹状图案可以是非均勻的，即呈波状，或在一定范围内可以是非一致的。 Alternatively, the striped pattern may be non-uniform, i.e. wavy, or within a certain range may be non-uniform. 条纹状图案不必扩展至包装的整个范围。 The striped pattern does not have to be extended to the entire range of the package. 该相可以是各种不同颜色，或包含颗粒、闪光剂或珠光剂。 The phases may be various different colors, or include particles, glitter or pearlescence. 本文使用的术语“多相个人护理组合物”是指旨在局部涂敷到皮肤或毛发上的组合物。  As used herein, the term "multiphase personal care composition" refers to compositions intended for topical application to the skin or the hair composition. 本文所用术语“不透明的”结构化区域是指具有有序结构（例如，层状结构、囊泡结构、立方体结构等）的表面活性剂域，并且在使用本文所述的超速离心法后，在IOmm内径的塑料离心管中，其在视觉上是肉眼不透明的。  As used herein, the term "opaque" refers to a region of the structured surfactant domain with ordered structures (e.g., a layered structure, the vesicle structure, cubic structure, etc. ), and using the ultracentrifugation method described herein after the inner diameter plastic centrifuge tube IOmm, it is visually opaque to naked eyes. 本文所用术语“相”是指具有一种平均组成的组合物区域，其不同于另一个具有不同平均组成的区域，其中所述区域是肉眼可见的。  As used herein, the term "phase" refers to a region of a composition having one average composition, which is different from another region having a different average composition, wherein the regions are visible. 这不排除不同的区域包含两种类似相，其中一相可包含颜料、染料、颗粒和各种任选成分，因此是具有不同平均组成的区域。 This does not preclude the distinct regions from comprising two similar phases where one phase could comprise pigments, dyes, particles, and various optional ingredients, hence a region of a different average composition. 优选至少一个相包含着色剂。 Preferably at least one phase contains a colorant. 本文所用术语“剪切指数”或“η”是粘度的量度，并与稠度值联合使用以定义物质的粘度，该物质的粘度为剪切速率的函数。  As used herein, the term "Shear Index" or "[eta]" is a measure of viscosity, used with Consistency value, to define viscosity material, the viscosity of the material is combined function of shear rate. 测量在25°C下进行，并且剪切指数的单位是无量纲的，并且稠度值单位为帕斯卡-秒（Pa-s)。 Measurements were performed at 25 ° C, and the units of Shear Index are dimensionless and Consistency Value in units of Pascal - seconds (Pa-s). 除非另外指明，本文所用术语“稳定的”是指在环境条件下处于直接接触状态至少约180天后，组合物保持至少两个“分离”相，其中在包装中不同位置的两相的分配不随时间而明显变化。  Unless otherwise indicated, as used herein, the term "stable" means in direct physical contact at ambient conditions of at least about 180 days, the composition maintain at least two "separate" phases, wherein in packaging the two phases in different locations distribution does not significantly change over time. “分离”是指在视觉上不同相的均勻分布性被破坏，以致至少一相的较大区域发生聚集，直至彼此相对的两种或多种组合物的平衡分配比被破坏。 "Isolated" refers to a uniform distribution of the visually distinct phases is destroyed, so that a larger area of ​​at least one phase collect until the balanced distribution of two or more compositions than is destroyed opposite to each other. 本文所用短语“基本上不含”是指组合物包含按所述组合物的重量计少于约3%， 优选少于约1 %，更优选少于约0. 5 %，甚至更优选少于约0. 25 %，并且最优选少于约0. 1 % 的规定成分。  As used herein, the phrase "substantially free" refers to a composition comprising by weight of the composition is less than about 3%, preferably less than about 1%, more preferably less than about 0.5%, and even more preferably less than about 0.25%, and most preferably less than about 0.1% of the specified ingredients in. 本文所用短语“紫外线稳定的”是指在紫外光照射下是稳定的。  As used herein, the phrase "UV stable" refers to a stable under UV irradiation. 例如，在褪色计（利用水冷却的氙灯模拟日光照射）中，将透明或半透明包装中的组合物暴露在紫外光下，如通过并列比较光照6小时（模拟3 0天日照）之前和之后所测定的，产品颜色没有显著褪色，其还可以通过有色相具有的低Δ Ecmc (例如，对于含60 %凡士林、39. 88 % HydrobritelOOO矿物油的混合物中的0. 012%着色剂浆液，Δ E可能小于5，优选小于4，更优选小于3，还更优选小于2)来测定。 For example, in a fade meter (Xenon lamp irradiation with simulated sunlight of water cooling), a transparent or translucent package composition exposed to ultraviolet light, such as light by-side comparison of 6 hours (0 days simulation of sunlight) before and after measured, the product color without significant discoloration, which can also have a hue having a low Δ Ecmc (e.g., for a 60% petrolatum containing mixture was 39. 88% HydrobritelOOO mineral oil to 0.012% colorant slurry, [Delta] E may be less than 5, preferably less than 4, more preferably less than 3, even more preferably less than 2) was determined. 除非另外指明，本文使用的所有百分比、份数和比率均按总组合物的重量计。  Unless otherwise indicated, all percentages, parts and ratios used herein are by weight of the total composition. 除非另外指明，有关所列成分的所有重量均基于活性物质的含量，因此它们不包括可能包括在市售材料中的溶剂或副产物。 Unless otherwise indicated, all weights as they pertain to listed ingredients are based on the active level and, therefore do not include solvents or byproducts that may include the commercially available materials. 本发明的多相个人护理组合物和方法可包括、由或基本上由本文所述发明的基本成分和限制以及本文所述的或其它用于旨在局部涂敷到毛发或皮肤上的个人护理组合物中的任何附加或任选成分、组分或限制组成。  The multiphase personal care compositions and methods of the present invention may comprise, consist or consist essentially intended by the invention and the essential elements and limitations described herein or otherwise described herein for topical application to the hair or skin any additional or optional ingredients in personal care compositions, or limitations described herein. 本发明的多相个人护理组合物典型地为液体状。  The multiphase personal care compositions of the present invention is typically liquid. 本文所用术语“液体”是指所述组合物在某种程度上通常是可流动的。 As used herein, the term "liquid" means that the composition is generally flowable to some degree. 因此，“液体”可包括旨在局部应用于皮肤上的液体、 半液体、霜膏、露剂或凝胶组合物。 Thus, "fluid" is intended for topical application may include a liquid, semi-liquid, cream, lotion or gel compositions on the skin. 通过提交于2004年2月6日的共同未决的申请序列号60/542, 710中描述的粘度方法测定，所述组合物典型显示具有约1. 5Pa/s(l, 500cps)至约1000Pa/s(l, 000, OOOcps)的粘度。 60/542, the viscosity measurement method described by 710 filed February 6, 2004, copending Application Serial No., the compositions typically exhibit about 1. 5Pa / s (l, 500cps) to approximately 1000Pa / s (l, 000, OOOcps) viscosity. 这些组合物包含至少两相，其将在下文中更详细地描述。 These compositions comprise at least two phases, which will be described in more detail below. 当用本文所述方法评测多相个人护理组合物时，除非另外在个别方法中指明，优选在混合之前对每个单独相进行评测。  When evaluating the multiphase personal care composition by the methods described herein, unless otherwise indicated in the individual methodology, preferably each individual phase is evaluated prior to mixing. 然而，如果所述相是组合的，可通过离心、超速离心、 吸移、过滤、洗涤稀释、浓缩或它们的组合将各相分离，然后对分开的组分或相进行评测。 However, if the phases are combined, by centrifugation, ultracentrifugation, pipetting, filtering, washing dilution, concentration, or combination thereof The phases were separated, and then the separate components or phases can be evaluated. 优选选择分离方法以使所得的待测分离组分不被破坏，但该组分是多相个人护理组合物中存在的代表性的组分。 Preferred separation means is chosen so that the resulting separated components is not destroyed, but the component is a component representative multiphase personal care composition present. 为说明本发明的组合物和方法，所设想的所有产品形式均为洗去型制剂，洗去型制剂是指将产品局部涂敷在皮肤或毛发上，接着随后（即在几分钟内）用水冲洗皮肤或毛发，或另外用基质或其它合适的去除工具来擦拭掉沉积的部分组合物。 To illustrate the compositions and methods of the present invention, all of the product forms contemplated are rinse-off formulations, rinse-off formulations is meant the product is applied topically to the skin or hair and then subsequently (i.e., within minutes) with water rinse the skin or hair, or additionally using a substrate or other suitable removal means with deposition of a portion wiped off composition. 在本发明多相个人护理组合物的一个优选实施方案中，所述组合物包含至少两个视觉上不同的相，其中至少一相在视觉上与第二相不同。  In a preferred embodiment of the multiphase personal care compositions of the present invention, the composition comprises at least two distinct phases visually, wherein at least one phase is visually different from the second phase. 所述视觉上不同的相以彼此直接接触的方式包装并且保持稳定。 The visually distinct phases are packaged in direct contact with each other and remain stable. 本发明的多相个人护理组合物包含至少两相，其中所述组合物可包含第一相、第二相等。 The multiphase personal care composition  of the present invention comprises at least two phases, wherein the composition can comprise a first phase a second phase. 第一相对第二相的比率为约1 ： 99至约99 ： 1，优选为90 ： 10至约10 ： 90， 更优选为约80 ： 20至约20 ： 80，甚至更优选为约70 ： 30至约30 ： 70，还甚至更优选为约60 ： 40至约40 ： 60，甚至还甚至更优选为约50 ： 50。 Ratio of the first relative to the second phase is from about 1: 99 to about 99: 1, preferably 90: 10 to about 10: 90, more preferably from about 80: 20 to about 20: 80, even more preferably from about 70: about 30 to 30: 70, still even more preferably from about 60: 40 to about 40: 60, and even still even more preferably from about 50: 50. 每一相可能为以下非限制性实施例的一种或多种，所述实施例包括：清洁相、有益相，其更详细地描述在下文中。 Each phase can be the following non-limiting examples of one or more of the embodiments includes: a cleansing phase, a benefit phase, which is described in more detail below. 所述多相个人护理组合物在视觉上不同相的至少一相中包含着色剂。  The multiphase personal care compositions of the different phases of the at least one phase comprises a colorant visually. 用于本发明中的着色剂对于紫外光照射是稳定的。 Used in the present invention are colorants for UV irradiation stable. 优选地，所述着色剂基本上不含钡和/或铝。 Preferably, the colorant is substantially free of barium and / or aluminum. 据信所述着色剂通过分配进入表面活性剂组分（其包含结构化区域）中可在清洁相稳定性方面起重要的作用。 It is believed that through the distribution of the colorant into the surfactant component (which comprises a structured region) may play an important role in the cleansing phase stability. 还据信包含钡和/或铝的着色剂有助于降解该结构化区域。 It is believed that further comprising barium and / or aluminum contributes to degradation of the colorant structured region. 所述钡和/或铝通过与阴离子基团（例如硫酸根）相互作用，与位于清洁相中的表面活性剂相互作用，从而破坏所述多相个人护理组合物的稳定性。 The barium and / or aluminum by interaction with anionic groups (e.g., sulfate) with a surfactant of the cleaning phase interaction, to destroy the stability of the multiphase personal care composition. 如下所述，使用可测定存在于多相个人护理组合物中的结构化区域百分数的超速离心法，当含有钡和/或铝的着色剂存在于多相个人护理组合物时，与具有基本上不含钡和/或铝的着色剂的多相个人护理组合物相比，其可以表明有多少结构化区域已经被降解。  As described below, may be used ultracentrifuge to determine the presence of the structured region multiphase personal care composition percent when containing barium and / or aluminum present in the colorant multiphase personal care composition, and having substantially free of barium and / or multi-phase personal care composition compared to the aluminum colorant, which shows how many structured region has been degraded. 因此，本发明的多相个人护理组合物优选包含基本上不含钡和/或铝的着色剂。  Accordingly, the multiphase personal care compositions of the invention preferably comprise substantially free of barium and / or aluminum colorant. 所述多相个人护理组合物包含按所述组合物的重量计约0. 00001%至约10%的所述着色剂。  The multiphase personal care composition comprising said colorant by weight of the composition, from about 0.00001% to about 10%. 多相个人护理组合物优选包含按所述组合物的重量计约0. 0001%至约1%， 更优选约0. 001%至约0. 1%，甚至更优选约0. 005%至约0. 05%的所述着色剂。 The multiphase personal care composition preferably comprises by weight of the composition, from about 0.0001% to about 1%, more preferably from about 0.001% to about 0.1%, and even more preferably from about 0.005% to about 0.05% of the colorant. 用于多相个人护理组合物中的着色剂选自有机颜料、无机颜料、干涉颜料、色淀、 天然着色剂、珠光剂、染料、胭脂红以及它们的混合物。  for the multiphase personal care composition is a colorant selected from organic pigments, inorganic pigments, interference pigments, lakes, natural colorants, pearlescent agents, dyes, carmine, and mixtures thereof. 着色剂的非限制性实施例包括：D&C红30滑石色淀、D&C红7钙色淀、D&C红34钙色淀、云母/ 二氧化钛/胭脂红颜料（Clorisonne红，购自Engelhard ；Duocrome RB,购自Engelhard ；Magenta，购自Rona ；Dichrona RB，购自Rona)、红30 低铁、色淀27 与色淀30 的D&C红色淀共混物、FD&C黄5色淀、Kowet 二氧化钛、黄色氧化铁、D&C红30色淀、D&C红28 色淀、Cos红氧化物BC、Cos氧化铁红BC、Cos氧化铁黑BC、Cos氧化铁黄、Cos氧化铁褐、Cos氧化铁黄BC、Euroxide 红Unsteril、Euroxide 黑Unsteril、Euroxide 黄Steril、Euroxide 黑Steril、Euroxide 红、Euroxide 黑、疏水Euroxide 黑、疏水Euroxide 黄、疏水Euroxide 红、D&C黄6色淀、D&C黄5锆色淀，以及这些着色剂的混合物。  Non-limiting examples of colorants include: D & C Red 30 Talc Lake, D & C Red 7 Calcium Lake, D & C Red 34 Calcium Lake, Mica / Titanium Dioxide / Carmine pigment (Clorisonne Red, available from Engelhard; Duocrome the RB, available from Engelhard; Magenta, available from Rona; Dichrona RB, commercially available from Rona), red 30 low iron, lake 27 and the lake D & C red lake blend 30, FD & C yellow 5 lake, Kowet titanium dioxide, yellow iron oxide, D & C red 30 lake, D & C red 28 lake, Cos red oxide the BC, Cos iron oxide red the BC, Cos iron oxide black the BC, Cos iron oxide yellow, Cos iron oxide brown, Cos iron oxide yellow BC, Euroxide red Unsteril, Euroxide black Unsteril, Euroxide yellow. Steril., Euroxide black. Steril., Euroxide red, Euroxide black, hydrophobic Euroxide black, hydrophobic Euroxide yellow, hydrophobic Euroxide red, D & C yellow 6 lake, D & C yellow 5 zirconium lake, and these colorants mixture. 本发明的多相个人护理组合物包含清洁相。 The multiphase personal care composition  The present invention comprises a cleansing phase. 所述清洁相包含表面活性剂组分或表面活性剂混合物。 The cleansing phase comprises a surfactant component or mixture of surfactants. 所述多相个人护理组合物包含按所述组合物的重量计约至约95%的所述清洁相。 The multiphase personal care composition comprising by weight of the composition of the cleaning composition is from about 95% to about phase. 表面活性剂组分包含表面活性剂或表面活性剂混合物。  The surfactant component comprises a surfactant or surfactant mixture. 表面活性剂组分包括适于涂敷到皮肤或毛发上的表面活性剂。 The surfactant component comprises suitable for application to the skin or the hair surfactant. 适用于本文的表面活性剂包括任何已知的或其它有效的适于涂敷到皮肤上的清洁表面活性剂，并且所述清洁表面活性剂还与多相个人护理组合物中包括水在内的其它基本成分相容。 Surfactants suitable for use herein include any known or otherwise effective cleansing surfactant suitable for application to the skin, and the cleansing surfactant further comprises a multiphase personal care composition including water other basic components are compatible. 这些表面活性剂包括阴离子表面活性剂、非离子表面活性剂、阳离子表面活性剂、两性离子表面活性剂或两性表面活性剂、皂或它们的组合。 These surfactants include anionic surfactants, nonionic surfactants, cationic surfactants, zwitterionic surfactants or amphoteric surfactants, soap or combinations thereof. 所述多相个人护理组合物优选包含表面活性剂组分，所述表面活性剂组分的浓度按所述多相个人护理组合物的重量计为约10 %至约99 %，更优选为约25 %至约90 %，甚至更优选为约35 %至约88 %，还更优选为约40 %至约85 %，并且还甚至更优选为约45 %至约85%。  The multiphase personal care composition preferably comprises a surfactant component, a surfactant component in a concentration by weight of the multiphase personal care composition, from about 10% to about 99%, more preferably from about 25% to about 90%, even more preferably from about 35% to about 88%, still more preferably from about 40% to about 85%, and still even more preferably from about 45% to about 85%. 所述多相个人护理组合物的优选pH范围为约5至约8，更优选为约6。 The preferred pH range of the multiphase personal care composition is from about 5 to about 8, more preferably about 6. 本发明中的表面活性剂组分显示具有非牛顿剪切致稀行为。 The surfactant component of the present invention exhibits Non-Newtonian shear thinning behavior. 所述表面活性剂组分包含结构化区域，所述结构化区域包含结构化的表面活性剂体系。  The surfactant component comprises a structured domain, the structured surfactant system comprising a region of the structure. 所述结构化区域能够将高含量的有益组分掺入到独立相中，所述有益组分在所述组合物中不乳化而是悬浮。 The structured region can be incorporation of high levels of benefit components to a separate phase of the benefit components in the composition, but not emulsified suspension. 在一个优选的实施方案中，所述结构化区域为不透明的结构化区域。 In a preferred embodiment, the structured domain is an opaque structured domain. 所述不透明的结构化区域优选为连续层状相。 The opaque structured domain is preferably a continuous lamellar phase. 层状相可产生层状凝胶网络，其是一类胶态体系。 The lamellar phase produces a lamellar gel network that is a type of colloidal system. 层状相可提供耐剪切性能，足以悬浮颗粒和小滴的屈服力，并同时提供长期稳定性，这是因为它们是热力学稳定的。 The lamellar phase provides resistance to shear, adequate yield to suspend particles and droplets and at the same time provides long term stability, since they are thermodynamically stable. 层状相可产生较高的粘度而无需粘度调节剂。 The lamellar phase yields a higher viscosity without the need for viscosity modifiers. 用下文所述的超速离心法测量，包含表面活性剂组分的多相个人护理组合物具有的结构化区域体积比率为至少约45%，优选为至少约50%，更优选为至少约55%，甚至更优选为至少约60 %，还更优选为至少约65 %，还甚至更优选为至少约70 %，并且还甚至还更优选为至少约80%。 The multiphase personal care composition is measured by ultracentrifugation described below, comprising a surfactant component having a structured domain volume ratio is at least about 45%, preferably at least about 50%, more preferably at least about 55% , even more preferably at least about 60%, still more preferably at least about 65%, yet even more preferably at least about 70%, and still even more preferably at least about 80%. 合适的表面活性剂描述在 McCutcheon 的“Detergents andEmulsifiers”（北美版（1986)，由Allured Publishing Corporation 出版）禾口McCutcheon 的“Functional Materials”（北美版（1992))、以及美国专利3，929，678中。  Suitable surfactants are described in McCutcheon's "Detergents andEmulsifiers" (North American edition (1986), published by Allured Publishing Corporation) Wo mouth McCutcheon's "Functional Materials" (North American edition (1992)), and U.S. Patent No. 3, 929,678 in. 适用于清洁相中的阴离子表面活性剂包括烷基硫酸盐和烷基醚硫酸盐。  The cleansing phase suitable anionic surfactants include alkyl sulfates and alkyl ether sulfates. 这些物质分别具有化学式ROSO3M和RO (C2H4O)xSO3M,其中R是具有约8至约M个碳原子的烷基或链烯基，χ为1至10，并且M是水溶性阳离子如铵离子、钠离子、钾离子或三乙醇胺离子。 These materials have the respective formulas ROSO3M and RO (C2H4O) xSO3M, wherein R is an alkyl or alkenyl group having from about 8 M to about carbon atoms, [chi] is 1 to 10, and M is a water-soluble cation such as ammonium, sodium , potassium and triethanolamine. 烷基醚硫酸盐典型可作为环氧乙烷与含有约8个至约M个碳原子的一元醇的缩合产物来制备。 Alkyl ether sulfates are typically made as condensation products of ethylene oxide containing from about 8 to about carbon atoms, M monohydric alcohol. 优选地，在烷基硫酸盐和烷基醚硫酸盐中，R具有约10至约18个碳原子。 Preferably, the alkyl sulfates and alkyl ether sulfates, R has from about 10 to about 18 carbon atoms. 该醇可衍生自脂肪，例如椰子油或牛油，或是合成的。 The alcohols can be derived from fats, e.g., coconut oil or tallow, or can be synthetic. 本文优选月桂醇和衍生自椰子油的直链醇。 Lauryl alcohol herein preferably straight chain alcohols derived from coconut oil. 上述醇可与约1至约10，优选约3至约5，并且更优选约3摩尔份数的环氧乙烷反应，并且将所得分子种类的混合物（例如，每摩尔醇具有平均3摩尔环氧乙烷）硫酸化并中和。 Such alcohols with from about 1 to about 10, preferably from about 3 to about 5, and more preferably about 3 moles of ethylene oxide preferably fraction, and the resulting mixture of molecular species (e.g., per mole of alcohol having an average of 3 moles ethylene oxide) sulfated and neutralized. 可用于清洁相中的烷基醚硫酸盐的具体实施例是椰油烷基三甘醇醚硫酸钠盐和铵盐、牛油烷基三甘醇醚硫酸钠盐和铵盐，以及牛油烷基六氧化乙烯硫酸钠盐和铵盐。 Specific Example  can be used in the cleansing phase of alkyl ether sulfates are sodium coconut alkyl triethylene glycol ether and ammonium salts, tallow alkyl triethylene glycol ether sulfate and ammonium salts, and six tallow alkyl sulfate and ammonium salts of ethylene oxide. 高度优选的烷基醚硫酸盐是包含单个化合物的混合物的那些，所述混合物具有约10至约16个碳原子的平均烷基链长，和约1至约4摩尔环氧乙烷的平均乙氧基化度。 Highly preferred alkyl ether sulfates are those comprising a mixture of individual compounds, said mixture having an average alkyl chain length of from about 10 to about 16 carbon atoms, an average of about 1 to about 4 ethoxy moles of ethylene oxide yl degree. 其它合适的阴离子表面活性剂包括通式为[R1-SO3-M]的有机硫酸反应产物的水溶性盐，其中R1选自具有约8至约M个，优选约10至约18个碳原子的直链或支链的饱和脂族烃基；并且M为阳离子。 Water-soluble salts  Other suitable anionic surfactants include the general formula [R1-SO3-M] an organic sulfuric acid reaction product, wherein R1 is selected having from about 8 to about M, preferably from about 10 to about 18 saturated aliphatic hydrocarbon straight or branched chain carbon atoms; and M is a cation. 合适的实施例是甲烷系列烃的有机硫酸反应产物的盐，包括具有约8至约M个碳原子，优选约10至约18个碳原子的异、新、新异和正链烷烃以及磺化剂，例如，根据已知磺化方法（包括漂白和水解）所得的S03、、发烟硫酸。 Suitable examples are the salts of the methane series hydrocarbon organic sulfuric acid reaction products, including having from about 8 to about M carbon atoms, preferably from about 10 to about 18 carbon atoms, different, new, novel, and n-paraffins, and a sulfonating agent , e.g., according to known sulfonation methods S03 (including bleaching and hydrolysis) resulting ,, fuming sulfuric acid. 优选的是磺化Cich18正链烷烃的碱金属盐和铵盐。 Preferred are alkali metal and ammonium salts of sulfonated Cich18 n-paraffins. 可用于清洁相中的优选的阴离子表面活性剂包括：月桂基硫酸铵、月桂基聚氧乙烯醚硫酸铵、月桂基硫酸三乙基胺、月桂基聚氧乙烯醚硫酸三乙基胺、月桂基硫酸三乙醇胺、月桂基聚氧乙烯醚硫酸三乙醇胺、月桂基硫酸单乙醇胺、月桂基聚氧乙烯醚硫酸单乙醇胺、月桂基硫酸二乙醇胺、月桂基聚氧乙烯醚硫酸二乙醇胺、月桂酸甘油单酯硫酸钠、月桂基硫酸钠、月桂基聚氧乙烯醚硫酸钠、月桂基聚氧乙烯醚硫酸钾、月桂基肌氨酸钠、月桂酰肌氨酸钠、肌氨酸月桂酯、椰油基肌氨酸、椰油基硫酸铵、十二烷酰基硫酸铵、椰油基硫酸钠、月桂酰硫酸钠、椰油基硫酸钾、月桂基硫酸钾、椰油基硫酸一乙醇胺、十三烷基苯磺酸钠、十二烷基苯磺酸钠、以及它们的组合。 Anionic surfactants  Preferred may be used in the cleansing phase include: triethyl ammonium lauryl sulfate, polyoxyethylene lauryl ether sulfate, lauryl sulfate, triethyl amine, polyoxyethylene lauryl ether ammonium sulfate , triethanolamine lauryl sulfate, monoethanolamine, triethanolamine lauryl polyoxyethylene ether sulfate, monoethanolamine lauryl sulfate, monoethanolamine lauryl polyoxyethylene ether sulfate, monoethanolamine lauryl sulfate, diethanolamine lauryl polyoxyethylene ether sulfate, diethanolamine lauryl acid monoglyceride sulfate, sodium lauryl sulfate, lauryl ether sulfate, lauryl polyoxyethylene ether sulfate, sodium lauryl sarcosinate, sodium lauroyl sarcosinate, lauryl sarcosine, cocoyl sarcosine, ammonium cocoyl sulfate, lauroyl sulfate, sodium cocoyl sulfate, sodium lauroyl sulfate, sodium cocoyl sulfate, potassium lauryl sulfate, monoethanolamine cocoyl sulfate, ten three benzene sulfonate, sodium dodecyl benzene sulfonate, and combinations thereof. 例如，在一些实施方案中，具有支链烷基链的阴离子表面活性剂（如十三烷基聚氧乙烯醚硫酸钠）是优选的。  For example, in some embodiments, the anionic surfactants (e.g., polyoxyethylene tridecyl ether sulfate) having a branched alkyl chain are preferred. 在一些实施方案中，可使用阴离子表面活性剂的混合物。 In some embodiments, the mixture of anionic surfactants may be used. 可将选自两性表面活性剂、两性离子表面活性剂、阳离子表面活性剂和/或非离子表面活性剂类别中的附加表面活性剂掺入到清洁相组合物中。  may be chosen from amphoteric surfactants, zwitterionic surfactants, cationic surfactants and / or non-ionic surfactant classes additional surfactant is incorporated into the cleansing phase compositions. 适用于清洁相中的两性表面活性剂包括被统称为脂族仲胺和叔胺衍生物的那些， 其中脂族基团可以是直链或支链的，并且其中一个脂肪族取代基包含约8个至约18个碳原子，并且一个脂肪族取代基包含阴离子水溶性基团，如羧基、磺酸根、硫酸根、磷酸根或膦酸根。  The cleansing phase suitable amphoteric surfactants include those known collectively as aliphatic derivatives of secondary and tertiary amines in which the aliphatic radicals can be straight-chain or branched, and wherein one of the aliphatic substituents It contains from about 8 to about 18 carbon atoms, and one of the aliphatic substituents contains an anionic water-solubilizing group, e.g. carboxy, sulfonate, sulfate, phosphate, or phosphonate. 属于该定义的化合物的实施例是：3-十二烷基氨基丙酸钠、3-十二烷基氨基丙烷磺酸钠、月桂基肌氨酸钠、N-烷基牛磺酸（如依照美国专利2，658，072中所提出的，由十二烷基胺与羟乙基磺酸钠进行反应而制得的那些）、N-高级烷基天冬氨酸（如依照美国专利2，438，091中所提出的方法制得的那些）、以及美国专利2，528，378中所描述的那些产物。 Examples of compounds falling within this definition are: 3-dodecyl amino propionate, sodium 3-dodecylaminopropane sulfonate, sodium lauryl sarcosinate, N- alkyl taurine (e.g., in accordance with U.S. Patent No. 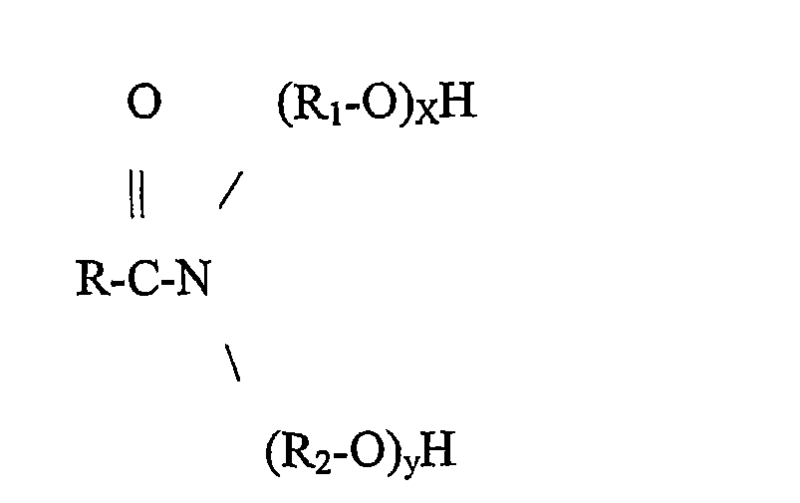 2,658,072 proposed in those), N- higher alkyl aspartic acids by the reaction of dodecylamine with sodium isethionate prepared (e.g., in accordance with U.S. Patent No. 2, those), U.S. Patent No. 2,528,378 and those products as described in the proposed method of 438,091 obtained. 其中R2为包含约8至约18个碳原子、0至约10个环氧乙烷部分和0至约1个甘油基的烷基、链烯基或羟烷基；Y选自氮原子、磷原子和硫原子；R3为包含1至约3个碳原子的烷基或一羟基烷基；当Y为硫原子时X为1，并且当Y为氮原子或磷原子时X为2 ;R4为包含约1至约4个碳原子的亚烷基或羟基亚烷基，并且Z为选自羧酸根、磺酸根、硫酸根、膦酸根和磷酸根基团的基团。  wherein R2 containing from about 8 to about 18 carbon atoms, from 0 to about 10 ethylene oxide moieties and from 0 to about 1 glyceryl alkyl, alkenyl or hydroxyalkyl groups; the Y selected from nitrogen atom, a phosphorus atom and a sulfur atom; R3 is containing from 1 to about 3 carbon atoms, an alkyl group or a hydroxyl group; Y is a sulfur atom when X is 1, and when Y is a nitrogen or phosphorus atom and X is 2 ; R4 is an alkylene or hydroxyalkylene group containing from about 1 to about 4 carbon atoms, and Z is selected from carboxylate, sulfonate, sulfate, phosphonate, and phosphate groups groups. 其它适用于清洁相中的两性离子表面活性剂包括含高级烷基甜菜碱在内的甜菜碱，如椰油二甲基羧甲基甜菜碱、椰油酰氨基丙基甜菜碱、椰油基甜菜碱、月桂酰氨基丙基甜菜碱、油基甜菜碱、月桂二甲基羧甲基甜菜碱、月桂二甲基-α-羧乙基甜菜碱、鲸蜡基二甲基羧甲基甜菜碱、月桂双-(2-羟乙基）羧甲基甜菜碱、硬脂双-(2-羟丙基）羧甲基甜菜碱、油基二甲基-Y -羧丙基甜菜碱和月桂双-(2-羟丙基）-ο-羧乙基甜菜碱。  Other suitable zwitterionic cleansing phase containing surfactants include betaines, including high alkyl betaines, such as coco dimethyl carboxymethyl betaine, cocoamidopropyl betaine, coconut oleyl betaine, lauryl amidopropyl betaine, oleyl betaine, lauryl dimethyl carboxymethyl betaine, lauryl dimethyl -α- carboxyethyl betaine, cetyl dimethyl carboxymethyl betaine, lauryl bis - (2-hydroxyethyl) carboxymethyl betaine, stearyl bis - (2-hydroxypropyl) carboxymethyl betaine, oleyl dimethyl -Y - carboxypropyl betaine and lauryl bis - (2-hydroxypropyl) -ο- carboxyethyl betaine. 磺基甜菜碱可以由椰油二甲基磺丙基甜菜碱、硬脂基二甲基磺丙基甜菜碱、月桂基二甲基磺乙基甜菜碱、月桂基二-(2-羟乙基）磺丙基甜菜碱等代表；酰氨基甜菜碱和氨基磺基甜菜碱（其中RCONH(CH2)3基团连接到甜菜碱的氮原子上）在本发明中也是有用的。 Propyl sulfobetaines may be from coconut dimethyl sulfopropyl betaine, stearyl dimethyl sulfopropyl betaine, lauryl dimethyl sulfoethyl betaine, lauryl bis- - (2-hydroxyethyl ) sulfopropyl betaine and the like Representative; amido betaines and sulfobetaines amino (wherein the RCONH (CH2) 3 group is attached to the nitrogen atom of the betaine) is also useful in the present invention. 还可使用两性乙酸盐和两性二乙酸盐。  Amphoacetates and may also be used diamphoacetates. 两性乙酸盐和两性二乙酸盐符合该化学式（上式），其中R是含有8至18个碳原子的脂族基团。  Amphoacetates and diamphoacetates conform to the formula (formula) wherein R is an aliphatic group having 8 to 18 carbon atoms. M是阳离子，如钠离子、钾离子、铵离子或取代的铵离子。 M is a cation such as sodium ion, potassium ion, ammonium ion or substituted ammonium ion. 在一些实施方案中， 优选N-月桂酰胺基乙基-N-羟乙基乙酸钠、N-椰油酰胺基乙基-N-羟乙基乙酸钠、N-月桂酰胺基乙基-N-羟乙基二乙酸钠和N-椰油酰胺基乙基-N-羟乙基二乙酸钠。 In some embodiments, preferably lauryl amido ethyl-N- hydroxyethyl -N- sodium acetate, sodium N- coco amido ethyl acetate -N- hydroxyethyl, lauryl amido ethyl-N- -N- hydroxyethyl cocamide diacetate, sodium and N- ethyl -N- hydroxyethyl sodium diacetate. 在清洁相中，还可使用阳离子表面活性剂，但通常较不优选，并且按所述组合物的重量计含量优选小于约5%。  In the cleaning phase, cationic surfactants may also be used, but are generally less preferred, and preferably the content by weight of the composition is less than about 5%. 适用于含水清洁相中的非离子表面活性剂包括氧化亚烷基团（本身亲水）与有机疏水化合物缩合的产物，该有机疏水化合物可实际为脂族化合物或烷基芳族化合物。  Nonionic surfactants suitable in the aqueous cleansing phase include alkylene oxide groups (hydrophilic in nature) with an organic hydrophobic compound condensation product of an organic hydrophobic compound which may be aliphatic compounds actual or alkyl aromatic compound . 在本发明一个可供选择的实施方案中，清洁相包含表面活性剂组分和电解质，所述表面活性剂组分包含至少一种非离子表面活性剂、至少一种阴离子表面活性剂和至少一种两性表面活性剂的混合物。  In the present invention an alternative embodiment, the cleansing phase comprising a surfactant component and an electrolyte, the surfactant component comprises at least one nonionic surfactant, at least one anionic surfactant and a mixture of at least one amphoteric surfactant. 优选包含非离子表面活性剂，所述非离子表面活性剂的浓度按所述表面活性剂组分的重量计为约0. 01%至约50%，更优选为约0. 10%至约10%，并且甚至更优选为约0. 5%至约5. 0%。  preferably comprises a non-ionic surfactant, the concentration of the nonionic surfactant by weight of the surface active agent component of from about 0.01% to about 50%, more preferably from about 0.10% to about 10%, and even more preferably from about 0.5% to about 5.0%. 可用于本发明的非离子表面活性剂包括选自以下的那些：烷基葡糖苷、烷基多葡糖苷、多羟基脂肪酸酰胺、烷氧基化脂肪酸酯、发泡蔗糖酯、氧化胺以及它们的混合物。  Nonionic surfactants of the present invention include those selected from: alkyl glucosides, alkyl polyglucosides, polyhydroxy fatty acid amides, alkoxylated fatty acid esters, lathering sucrose esters, oxidation amines and mixtures thereof. 可用于本文的优选非离子表面活性剂的非限制性实施例是选自C8-C14葡萄糖酰胺、C8-C14烷基多葡糖苷、蔗糖椰油酸酯、蔗糖月桂酸酯以及它们混合物的那些。 Non-limiting examples  may be used herein is preferably a nonionic surfactant selected from C8-C14 glucose amides, C8-C14 alkyl polyglucosides, sucrose cocoate, sucrose laurate, and mixtures thereof of those. 在一个优选的实施方案中，非离子表面活性剂选自单羟基硬脂酸甘油酯、硬脂基聚氧乙烯醚-2、羟基硬脂酸、硬脂酸丙二醇酯、PEG-2硬脂酸酯、一硬脂酸脱水山梨醇酯、硬脂酸甘油酯、月桂基聚氧乙烯醚-2以及它们的混合物。 In a preferred embodiment, the nonionic surfactant is selected from glyceryl monohydroxy stearate, stearyl polyoxyethylene ether -2, hydroxystearic acid, propylene glycol stearate, PEG-2 stearate ester, a sorbitan monostearate, glyceryl stearate, polyoxyethylene lauryl ether, -2, and mixtures thereof. 在一个优选的实施方案中，非离子表面活性剂为硬脂基聚氧乙烯醚-2。 In a preferred embodiment, the nonionic surfactant is a polyoxyethylene stearyl ether -2. 还可用于本发明的非离子表面活性剂包括月桂基氧化胺、椰油基氧化胺。  Nonionic surfactants may also be used in the present invention include lauryl amine oxide, cocoamine oxide. 在本发明的一个可供选择的实施方案中，多相个人护理组合物可包含至少一种阴离子表面活性剂。  In an alternate embodiment of the present invention, the multiphase personal care composition may comprise at least one anionic surfactant. 先前已描述了合适的阴离子表面活性剂的非限制性实施例。 It has been previously described non-limiting examples of suitable anionic surfactants. 在本发明的一个可供选择的实施方案中，多相个人护理组合物可包含至少一种两性表面活性剂。  In an alternate embodiment of the present invention, the multiphase personal care composition may comprise at least one amphoteric surfactant. 先前已描述了合适的两性表面活性剂的非限制性实施例。 It has been previously described non-limiting examples of suitable amphoteric surfactants. 若使用电解质，则可将电解质本身加入到多相个人护理组合物中，或其可通过包含于一种原料中的抗衡离子就地形成。  When using the electrolyte, the electrolyte itself can be added to the multiphase personal care composition, or may be formed in situ via the counterions included in one kind of raw material. 优选地，电解质包括一个阴离子（包括磷酸根、氯离子、硫酸根或柠檬酸根）和一个阳离子（包括钠离子、铵离子、钾离子、镁离子或它们的混合物）。 Preferably, the electrolyte comprises an anion (comprising phosphate, chloride, sulfate or citrate) and a cation (including sodium, ammonium, potassium, magnesium or mixtures thereof). 一些优选的电解质是氯化钠或氯化铵，或者硫酸钠或硫酸铵。 Some preferred electrolytes are sodium or ammonium chloride or sodium or ammonium sulfate. 优选的电解质是氯化钠。 Preferred electrolyte is sodium chloride. 优选将电解质加入到组合物的表面活性剂组分中。 The electrolyte is preferably added to the surfactant component of the composition. 当含有电解质时，电解质的含量应有利于形成稳定的组合物（非牛顿剪切致稀性质）。  When containing an electrolyte, the electrolyte content should be conducive to forming a stable composition (Non-Newtonian shear thinning behavior). 通常，该含量按所述多相个人护理组合物的重量计为约0. 至约15%，优选约至约6%，但可根据需要变化。 Typically, the content by weight of the multiphase personal care composition, from about 0.5 to about 15%, preferably from about to about 6%, but can be varied as desired. 至C18饱和或不饱和的直链或支链脂族基团；礼和&为相同的或不同的C2-C4直链或支链脂族基团；χ为O至10 ;y为1至10 ；和其中χ和y的和小于或等于10。 To C18 saturated or unsaturated, linear or branched aliphatic group; Li and & are the same or different C2-C4 straight or branched-chain aliphatic group; [chi] is O to 10; y is 1 to 10 ; and wherein χ and y is less than or equal to 10. 所述组合物中链烷醇酰胺的量按所述起泡清洁相的重量计典型地为约0. 至约10%，而在一些实施方案中按所述起泡清洁相的重量计优选为约2%至约5%。  The amount of alkanolamide in the composition of the chain by the weight of the foaming cleansing phase is typically from about 0.5 to about 10%, and in some embodiments, by weight of the cleansing phase of foaming It is preferably from about 2% to about 5%. 合适的链烷醇酰胺包括椰油酰胺MEA (椰油基单乙醇酰胺）和椰油酰胺MIPA (椰油基单异丙醇酰胺）。 Suitable alkanolamides include cocamide MEA (coco monoethanolamide) and cocamide MIPA (coco monoisopropanolamide). 本发明的清洁相任选但优选还包含约0. 至10%重量的层状助洗剂，其在组合物中的作用是形成热动力学域，优选层状（结构化）热力学域。  The cleaning with the present invention optionally but preferably further comprising from about 0.5 to layered builders 10% by weight, and its role in the composition are thermodynamically domains form, preferably lamellar (structured) Thermodynamic area. 据信层状域可增强本组合物相之间的界面稳定性。 It is believed that lamellar domain enhances the interfacial stability between the phases of the present compositions. P0LYCARE® 133购自Iihodia)。 P0LYCARE® 133 available from Iihodia). 层状助洗剂优选选自月桂酸或三羟基硬脂酸甘油酯。 Layered builders are preferably selected from lauric acid or trihydroxystearin. 本发明的多相个人护理组合物可包含有益相。 The multiphase personal care composition  of the present invention may comprise a benefit phase. 本发明的有益相优选是无水的。 The benefit phase of the present invention is preferably anhydrous. 所述有益相包含疏水组合物，所述疏水组合物包含疏水组分。 The benefit phase comprises a hydrophobic composition, the hydrophobic composition comprising a hydrophobic component. 所述有益相包含约20%至约100%,优选至少约35%，最优选至少约50%的疏水组分。 The benefit phase comprises from about 20% to about 100%, preferably at least about 35%, most preferably at least about 50% of a hydrophobic component. 所述疏水组合物优选选自具有如200年2月6日提交的共同未决的申请序列号60Λ42，710中所述指定流变学性质的那些， 所述流变学性质包括所选的稠度值（k)和剪切指数（η)。 The hydrophobic compositions are preferably selected as those having a consistency selected, the rheological properties 60Λ42,710 copending application Serial No. 200, filed February 6, specified in the rheological properties include value (k) and shear index (η). 这些优选的流变学性质在向多相个人护理组合物提供疏水组分在皮肤上改善的沉积方面，是尤其有用的。 These preferred rheological properties in the deposition of hydrophobic components to improve the multi-phase personal care composition on the skin, are particularly useful. 适用于本文的疏水组分的非限制性实施例可包括：多种烃、油和蜡、硅氧烷、脂肪酸衍生物、胆固醇、胆固醇衍生物、甘油二酯、甘油三酯、植物油、植物油衍生物、乙酸甘油酯、烷基酯、链烯基酯、聚甘油脂肪酸酯、羊毛脂及其衍生物、蜡酯、蜂蜡衍生物、留醇和磷脂、维生素和维生素原以及它们的组合。  Nonlimiting examples of suitable hydrophobic components herein may include: a variety of hydrocarbons, oils and waxes, silicones, fatty acid derivatives, cholesterol, cholesterol derivatives, diglycerides, triglycerides, vegetable oils , vegetable oil derivatives, triacetin, alkyl esters, alkenyl esters, polyglycerin fatty acid esters, lanolin and its derivatives, wax esters, beeswax derivatives, left and phospholipids, vitamins and pro-vitamins, and combinations thereof . 适用于本文的烃油和蜡的非限制性实施例包括凡士林、矿物油、微晶蜡、聚烯烃、 石蜡、野樱素、地蜡、聚乙烯、全氢化角鲨烯、以及它们的组合。  suitable for use herein hydrocarbon oils and waxes, non-limiting examples include petrolatum, mineral oil microcrystalline waxes, polyalkenes, paraffins, cerasin, ozokerite, polyethylene, perhydrosqualene alkenyl, and their The combination. 适用作本文疏水组分的硅氧烷油的非限制性实施例包括聚二甲基硅氧烷共聚多元醇、二甲基聚硅氧烷、二乙基聚硅氧烷、混合的C1-C30烷基聚硅氧烷、苯基聚二甲基硅氧烷、聚二甲基硅氧烷醇、以及它们的组合。  The silicone oils suitable for use as hydrophobic components herein, non-limiting examples include dimethicone copolyol, dimethyl polysiloxane, diethyl polysiloxane, mixed C1-C30 alkyl polysiloxane, phenyl dimethicone, dimethicone alcohol, and combinations thereof. 优选非挥发性硅氧烷，其选自聚二甲基硅氧烷、聚二甲基硅氧烷醇、混合的C1-C30烷基聚硅氧烷、以及它们的组合。 Preferred non-volatile silicones selected from dimethicone, dimethicone alcohol, mixed C1-C30 alkyl polysiloxane, and combinations thereof. 可用于本文的硅氧烷油的非限制性实施例描述于美国专利5，011，681 (Ciotti等人）中。 Nonlimiting examples of silicone oils useful herein are described in U.S. Patent No. 5,011,681 (Ciotti et al.). 适用作本文疏水性组分的甘油二酯和甘油三酯的非限制性实施例包括：蓖麻油、 大豆油、衍生大豆油（如马来酸大豆油）、红花油、棉籽油、玉米油、胡桃油、花生油、橄榄油、 鳕鱼肝油、杏仁油、鳄梨油、棕榈油和芝麻油、植物油、向日葵籽油、以及植物油衍生物；椰子油及衍生椰子油、棉籽油及衍生棉籽油、霍霍巴油、椰子油、以及它们的组合。  suitable as hydrophobic component diglycerides and triglycerides herein, non-limiting examples include: castor oil, soy bean oil, derivatized soybean oils (e.g., maleated soy bean) oil, safflower oil, cotton seed oil , corn oil, walnut oil, peanut oil, olive oil, cod liver oil, almond oil, avocado oil, palm oil and sesame oil, vegetable oils, sunflower seed oil, and vegetable oil derivatives; coconut oil and derivatized coconut oil, cottonseed oil and derivatized cottonseed oil, jojoba oil, coconut oil, and combinations thereof. 适用作本文疏水组分的乙酰甘油酯的非限制性实施例包括乙酰化的单酸甘油酯。  suitable for use as hydrophobic components herein, non-limiting examples of glycerides include acetylated monoglycerides acetylated. 适用作本文疏水组分的烷基酯的非限制性实施例包括脂肪酸异丙酯和长链（即C10-C24)脂肪酸的长链酯（如蓖麻油酸鲸蜡酯），其非限制性实施例包括棕榈酸异丙酯、肉豆蔻酸异丙酯、蓖麻油酸鲸蜡酯和蓖麻油酸十八烷基酯。  alkyl esters suitable for use as hydrophobic components herein, non-limiting examples include fatty acids, isopropyl and long chain (i.e. C10-C24) esters of long chain fatty acids (e.g., cetyl ricinoleate), non- limiting examples include isopropyl palmitate, isopropyl myristate, cetyl ricinoleate and stearyl ricinoleate. 其它实施例为：月桂酸己酯、月桂酸异己酯、肉豆蔻酸十四烷基酯、棕榈酸异己酯、油酸癸酯、油酸异癸酯、硬脂酸十六烷酯、硬脂酸癸酯、异硬脂酸异丙酯、己二酸二异丙酯、己二酸二异己酯、己二酸二己基癸基酯、癸二酸二异丙酯、酰基异壬酸酯、乳酸月桂酯、乳酸十四烷酯、乳酸鲸蜡酯、以及它们的组合。 Other embodiments are: hexyl laurate, isohexyl laurate, myristyl myristate, isohexyl palmitate, decyl oleate, isodecyl oleate, hexadecyl stearate, stearyl decyl methacrylate, isopropyl isostearate, diisopropyl adipate, diisohexyl adipate, adipate, dihexyl decyl acrylate, diisopropyl sebacate, acyl isononanoate, lauryl lactate, myristyl lactate, cetyl lactate, and combinations thereof. 适用作本文疏水组分的链烯基酯的非限制性实施例包括肉豆蔻酸油基酯、硬脂酸油基酯、油酸油基酯、以及它们的组合。  suitable for use as hydrophobic components herein, non-limiting examples of alkenyl esters include oleyl myristate stearate, oleyl oleate, oleyl ester, and combinations thereof. 适用作本文疏水组分的脂肪酸聚甘油酯的非限制性实施例包括：二硬脂酸十甘油酯、二异硬脂酸十甘油酯、一肉豆蔻酸十甘油酯、一月桂酸十甘油酯、一油酸六甘油酯以及它们的组合。  suitable for use as hydrophobic components herein polyglycerin fatty acid esters, non-limiting examples include: decaglyceryl distearate, decaglyceryl diisostearate, decaglyceryl a myristic acid, a lauric acid decaglyceryl, hexaglyceryl monooleate, and combinations thereof. 适用作本文疏水组分的羊毛脂和毛脂衍生物的非限制性实施例包括：羊毛脂、羊毛脂油、羊毛脂蜡、羊毛脂醇、羊毛脂脂肪酸、羊毛脂酸异丙酯、乙酰化羊毛脂、乙酰化羊毛脂醇、亚油酸羊毛脂醇酯、蓖麻油酸羊毛脂醇酯、以及它们的组合。  suitable for use as hydrophobic components herein, non-limiting examples of lanolin and lanolin derivatives include: lanolin, lanolin oil, lanolin wax, lanolin alcohols, lanolin fatty acid isopropyl ester, acetylated lanolin, acetylated lanolin alcohols, lanolin alcohol linoleate esters, ricinoleic acid esters of lanolin alcohol, and combinations thereof. 其它适宜的疏水组分还包括牛奶甘油三酯（如羟基化牛奶甘油酯）和多元醇脂肪酸聚酯。  Still other suitable hydrophobic components include milk triglycerides (e.g., hydroxylated milk glyceride) and polyol fatty acid polyesters. 其它适宜的疏水组分还包括蜡酯，其非限制性实施例包括蜂蜡和蜂蜡衍生物、鲸蜡、肉豆蔻酸十四烷基酯、硬脂酸十八烷基酯、以及它们的组合。  Other suitable hydrophobic components include wax esters, non-limiting examples of which include beeswax and beeswax derivatives, spermaceti, myristyl myristate, stearyl stearate, and their The combination. 还有用的是植物蜡，例如巴西棕榈蜡和小烛树蜡；甾醇，例如胆固醇、胆固醇脂肪酸酯；和磷脂如卵磷脂及衍生物、鞘脂类、神经酰胺、糖鞘脂、以及它们的组合。 Also useful are vegetable waxes such as carnauba wax and candelilla wax; sterols, such as cholesterol, cholesterol fatty acid esters; and phospholipids such as lecithin and derivatives, Sphingolipids, ceramides, glycosphingolipids, as well as their combination. 在一个优选的实施方案中，多相个人护理组合物可包含具有有益相的多相组合物；其中所述有益相优选可包含一种或多种疏水组分，其中按重量计至少20%的疏水组分选自凡士林、矿物油、向日葵籽油、微晶蜡、石蜡、地蜡、聚乙烯、聚丁烯、聚癸烯和全氢化角鲨烯聚二甲基硅氧烷、环状聚甲基硅氧烷、烷基硅氧烷、聚甲基硅氧烷和甲基苯基聚硅氧烷、羊毛脂、羊毛脂油、羊毛脂蜡、羊毛脂醇、羊毛脂脂肪酸、羊毛脂酸异丙酯、乙酰化羊毛脂、乙酰化羊毛脂醇、亚油酸羊毛脂醇酯、蓖麻油酸羊毛脂醇酯、蓖麻油、大豆油、马来酸大豆油、红花油、棉籽油、玉米油、胡桃油、花生油、橄榄油、鳕鱼肝油、杏仁油、鳄梨油、棕榈油和芝麻油、以及它们的组合。  In a preferred embodiment, the multiphase personal care composition may comprise a multiphase composition having a benefit phase; wherein the benefit phase preferably can comprise one or more hydrophobic components, wherein by weight, at least 20% of the hydrophobic component is selected from petrolatum, mineral oil, sunflower seed oil, microcrystalline wax, paraffin, ozokerite, polyethylene, polybutene, polydecene and perhydrosqualene alkenyl polydimethylsiloxane, cyclomethicones, alkyl siloxanes, methicone and methylphenyl polysiloxane, lanolin, lanolin oil, lanolin wax, lanolin alcohols, lanolin fatty acids, wool fatty acid isopropyl lanolate, acetylated lanolin, acetylated lanolin alcohols, lanolin alcohol linoleate ester, ricinoleic acid lanolin alcohol esters, castor oil, soy bean oil, maleated soy bean oil, safflower oil, cotton seed oil, corn oil, walnut oil, peanut oil, olive oil, cod liver oil, almond oil, avocado oil, palm oil and sesame oil, and combinations thereof. 更优选地，按重量计，至少约50%的疏水组分选自：凡士林、矿物油、石蜡、聚乙烯、聚丁烯、聚癸烯、聚二甲基硅氧烷、烷基硅氧烷、环状聚甲基硅氧烷、羊毛脂、羊毛脂油、羊毛脂蜡。 More preferably, by weight, of at least about 50% of a hydrophobic component selected from: petrolatum, mineral oil, paraffin wax, polyethylene, polybutene, polydecene, dimethicones, alkyl siloxane , cyclomethicones, lanolin, lanolin oil, lanolin wax. 剩余的疏水组分优选选自：棕榈酸异丙酯、蓖麻油酸鲸蜡酯、异壬酸辛酯、棕榈酸辛酯、硬脂酸异十六烷基酯、羟基化牛奶甘油酯以及它们的组合。 The remaining hydrophobic component is preferably selected from: isopropyl palmitate, cetyl ricinoleate, isononyl octyl, octyl palmitate, isocetyl stearate esters, hydroxylated milk glyceride and combinations thereof . 所述多相个人护理组合物可包含颗粒。 The  The multiphase personal care composition may comprise particles. 可使用各种形状和密度的水不溶性固体颗粒。 It may be of various shapes and densities water insoluble solid particles. 在一个优选的实施方案中，颗粒倾向于具有球形、椭圆形、不规则形或任何其它形状，其中最大尺寸与最小尺寸的比率（定义为纵横比）小于约10。 In a preferred embodiment, the particles tend to have a spherical, elliptical, irregular, or any other shape, wherein the ratio of the largest dimension to the smallest dimension (defined as the aspect ratio) of less than about 10. 更优选地，颗粒的纵横比小于约8，还更优选地，颗粒的纵横比小于约5。 More preferably aspect, the particle is less than about 8, still more preferably, the aspect ratio of the particles is less than about 5. 本发明的多相个人护理组合物包含美容有效量的颗粒。 The multiphase personal care composition  of the present invention comprising a cosmetically effective amount of particles. 优选地，所述颗粒的含量按所述组合物的重量计为至少约0. 1%，更优选至少约0. 2 %，甚至更优选至少约0. 5%，还更优选至少约1%，并且甚至还更优选至少2%。 Preferably, the content of the particles by weight of the composition, of at least about 0.1%, more preferably at least about 0.2%, even more preferably at least about 0.5%, still more preferably at least about 1% , and even more preferably at least 2%. 在本发明的多相个人护理组合物中，所述颗粒的含量按所述组合物的重量计优选不超过约50%，更优选不超过约30%，还更优选不超过约20 %，甚至更优选不超过约10 %。 In the multiphase personal care compositions of the present invention, the content of the particles by weight of the composition preferably not more than about 50%, more preferably no more than about 30%, still more preferably not more than about 20%, even preferably no more than about 10%. 优选地，所述颗粒还具有不被组合物典型加工所显著影响的物理属性。  Preferably, the particles also have not to be significantly influenced by typical processing of the composition physical properties. 优选地，使用熔点大于约70°C，更优选大于约80°C，甚至更优选大于约95°C的颗粒。 Preferably, a melting point of greater than about 70 ° C, more preferably greater than about 80 ° C, and even more preferably greater than about 95 ° C of the particles. 本文所用熔点是指使颗粒转变为液体或流体状态或经历显著变形或物理性质改变时的温度。 As used herein, melting point would refer particle transitions to a liquid or fluid state or undergoes significant deformation or the temperature at which a change in physical properties. 此外，本发明的许多颗粒是交联的或具有交联的表面膜。 In addition, many of the particles of the present invention is a crosslinked or crosslinked with a surface film. 这些颗粒不显示具有明显的熔点。 These particles do not exhibit a distinct melting point. 只要交联颗粒在组合物制备中所用的加工和储存条件下是稳定的，它们也是可用的。 As long as the processing and storage conditions for the preparation of crosslinked particles used in the compositions are stable, they are also available. 可存在于本发明中的颗粒可以是天然的、合成的或半合成的。  may be present in the particles of the present invention may be natural, synthetic or semi-synthetic. 此外，也可存在混合颗粒。 Further, there may be mixed granules. 合成颗粒可由交联聚合物或非交联聚合物制得。 Synthesis of crosslinked polymer particles can be non-cross-linked polymer obtained. 本发明的颗粒可具有表面电荷，或者它们的表面可用有机或无机材料如表面活性剂、聚合物和无机材料改性。 Particles of the present invention can have surface charges or their surface can be an organic-inorganic materials such as surfactants, polymers or inorganic materials, and modified. 可存在颗粒复合物。 Particle complex can be present. 天然颗粒的非限制性实例包括各种亲水或疏水形式的沉淀二氧化硅颗粒，以商品名Sipernet 购自Degussa-Huls。  Non-limiting examples of natural particles include various precipitated in the form of a hydrophilic or hydrophobic silica particles, commercially available under the trade name Sipernet from Degussa-Huls. 以商品名Sipernet D11™购自Degussa 的Precipitated™ 疏水合成无定形二氧化硅是优选的颗粒。 Sipernet D11 ™ trade name from Degussa Precipitated ™ hydrophobic synthetic amorphous silica particles are preferred. Snowtex胶态二氧化硅颗粒购自NissanChemical America Corporation。 Snowtex colloidal silica particles available from NissanChemical America Corporation. 合成颗粒的非限制性实施例包括尼龙、硅氧烷树脂、聚（甲基）丙烯酸酯、聚乙烯、 聚酯、聚丙烯、聚苯乙烯、聚氨酯、聚酰胺、环氧树脂、脲醛树脂和丙烯酸粉末。  Non-limiting examples of synthetic particles include nylon, silicone resins, poly (meth) acrylates, polyethylene, polyester, polypropylene, polystyrene, polyurethane, polyamide, epoxy resins, urea and acrylic resin powder. 有用的颗粒的非限制性实施例是Microease 110S、114S、116 (微粉化合成蜡），Micropoly210、250S (微粉化聚乙烯），Microslip (微粉化聚四氟乙烯）和MicrosiIk (聚乙烯和聚四氟乙烯的组合）， 所有这些均购自Micro Powder, he.。 Non-limiting examples of useful particles are Microease 110S, 114S, 116 (micronized synthetic waxes), Micropoly210,250S (micronized polyethylene), Microslip (micronized polytetrafluoroethylene), and MicrosiIk (polyethylene and polytetramethylene vinyl fluoride combination), all of which are available from Micro Powder, he .. 其它实施例包括购自Phenomenex的Luna (光滑的二氧化硅颗粒)颗粒、MP-2200(聚甲基丙烯酸甲酯)、EA-209(乙烯/丙烯酸酯共聚物)、 SP-501(尼龙-12)、ES-830(聚甲基丙烯酸甲酯）、购自Kobo Products, Inc.的BPD-800、 BPD_500(聚氨酯）颗粒和以商品名Tospearl颗粒购自（S Silicones的硅氧烷树脂。 Ganzpear 1GS-0605交联聚苯乙烯（购自Presperse)也是有用的。 Other embodiments include commercially available from Phenomenex Luna (smooth silica particles) particles, MP-2200 (polymethylmethacrylate), EA-209 (ethylene / acrylate copolymer), SP-501 (nylon-12 ), ES-830 (polymethyl methacrylate), available from Kobo Products, Inc. of BPD-800, BPD_500 (polyurethane) particles and particles tradename Tospearl available from (S silicones silicone resins. Ganzpear 1GS -0605 crosslinked polystyrene (available from Presperse) is also useful. 混合颗粒的非限制性实例包括Ganzpearl GSC_30SR(绢云母和交联聚苯乙烯混合粉末)和SM-1000、SM-200 (云母和二氧化硅混合粉末，购自I^resperse)。  Non-limiting examples of hybrid particles include Ganzpearl GSC_30SR (Sericite & crosslinked polystyrene hybrid powder), and SM-1000, SM-200 (mica and silica hybrid powder available from I ^ resperse). 剥脱剂颗粒选自聚乙烯、微晶蜡、霍霍巴油酯、无定形二氧化硅、滑石、正磷酸钙或它们的混合物等。  The exfoliant particle is selected from polyethylene, microcrystalline wax, jojoba esters, amorphous silica, talc, tribasic calcium phosphate and the like or mixtures thereof. 剥脱剂颗粒沿颗粒的长轴的粒度尺寸为约100微米至约600微米，优选约100微米至约300微米。 Particle size of the particles along the major axis of the exfoliant particles is from about 100 microns to about 600 microns, preferably from about 100 microns to about 300 microns. 剥脱剂颗粒具有小于约4莫氏，优选小于约3莫氏的硬度。 The exfoliant particle has less than about 4 Mohs, preferably less than about 3 Mohs hardness. 如此测定的硬度是具体物质抗粉碎能力的标准。 The hardness as so measured is the ability of a standard crush concrete material. 它被视为是颗粒成分研磨特性的相当好的指示。 It is considered a fairly good indication of the particle component of polishing characteristics. 以下是依照莫氏硬度标度，按硬度升序排列的物质实施例：h(硬度）_1 ：滑石；h-2 ： 石膏，岩盐，通常的结晶盐，重晶石，白垩，硫黄；h-4 ：萤石，软磷酸盐，菱镁矿，石灰石；h-5 ： 磷灰石，硬磷酸盐，硬石灰石，铬铁矿，矾土；h-6 ：长石，钛铁矿，角闪石；h-7 ：石英，花岗岩； h-8 ：黄玉；h-9 ：晶态氧化铝，刚玉；和h-ΙΟ ：金刚石。 The following according to the Moh hardness scale, the hardness of the material according to Example ascending order: H (hardness) _1: talc; h-2: gypsum, rock salt, crystalline salt in general, barytes, chalk, sulfur; h-4 : fluorite, soft phosphate, magnesite, limestone; h-5: apatite, hard phosphate, hard limestone, chromite, bauxite; h-6: feldspar, ilmenite, hornblende ; h-7: quartz, granite; h-8: topaz; h-9: crystalline alumina, corundum; and h-ΙΟ: diamond. 优选地，所述剥脱剂颗粒具有与清洁相截然不同的颜色。  Preferably, the exfoliant particles have a color distinct from the cleansing phase. 剥脱剂颗粒优选的含量按所述组合物的重量计小于约10%，优选小于约5%。 The exfoliant particle is preferably an amount by weight of the composition is less than about 10%, preferably less than about 5%. 所述多相个人护理组合物可包含闪光颗粒。 The  The multiphase personal care composition can comprise a shiny particle. 在一个优选的实施方案中，闪光颗粒在多相个人护理组合物的至少一相中。 In a preferred embodiment, the shiny particle in at least one phase of the multiphase personal care composition. 闪光颗粒的非限制性实施例包括以下这些：干涉颜料、多层颜料、金属颗粒、固体和液晶、或它们的组合。 Nonlimiting examples of shiny particles include the following: interference pigment, multi-layered pigment, metallic particle, solid and liquid crystals, or combinations thereof. 干涉颜料是具有珍珠光泽的颜料，可通过用薄膜包涂颗粒基质材料的表面制得。  The interference pigment is a pigment with pearl gloss, can be obtained by coating the surface with a thin film made of the particles have a matrix material. 颗粒基质材料通常为小片状。 Particle substrate material is generally platelet in shape. 薄膜是具有高折射率的透明或半透明材料。 Film having a high refractive index transparent or translucent material. 高折射率材料显示具有珠光色，这是由从小片状基质/涂层界面反射的入射光和从涂层表面反射的入射光之间的相互干涉作用产生的。 A high refractive index material shows a pearl gloss, which is produced by the action of mutual interference between the small sheet-shaped substrate / coating layer interface and reflection of incident light reflected from the coated surface of incident light. 多相个人护理组合物的干涉颜料的含量优选不超过组合物的约20%重量，更优选不超过约10%重量，甚至更优选不超过约7%重量，还更优选不超过所述多相个人护理组合物的约5%重量。 The interference pigments of the multi-phase personal care composition preferably does not exceed about 20% by weight of the composition, preferably no more than about 10% by weight, and even more preferably no more than about 7% by weight, still more preferably no more than multiphase about 5% by weight of the personal care composition. 多相个人护理组合物中干涉颜料的含量按所述多相个人护理组合物的重量计优选为至少约0. 重量，更优选至少约0. 2%重量，甚至更优选至少约0. 5%重量，还更优选至少约重量。 Content of the pigment in the multiphase personal care composition interferometer by weight of the multiphase personal care composition preferably is at least about 0.5 by weight, more preferably at least about 0.2% by weight, even more preferably at least about 0.5% by weight, still more preferably at least about weight. 干涉颜料可包含多层结构。  The interference pigment can comprise a multilayer structure. 颗粒中心是折射率（RI)通常低于1. 8的扁平基质。 It is the center of the particle refractive index (RI) normally below 1.8 the flat substrate. 多种颗粒基质可用于本文。 Variety of particle substrates are useful herein. 非限制性实施例为天然云母、合成云母、石墨、滑石、高岭土、氧化铝片、氯氧化铋、二氧化硅片、玻璃片、陶瓷、二氧化钛、CaSO4, CaC03> BaSO4、硼硅酸盐以及它们的混合物，优选云母、二氧化硅和氧化铝片。 Nonlimiting examples are natural mica, synthetic mica, graphite, talc, kaolin, alumina flakes, bismuth oxychloride, silica flake, glass flake, ceramics, titanium dioxide, CaSO4, CaC03> BaSO4, borosilicate and their mixtures thereof, preferably mica, silica and alumina flakes. 可在上述基质的表面上涂敷一层薄膜或多层薄膜。  may be coated with a thin film or a multilayer film on the surface of the substrate. 薄膜是由高折射材料制成的。 Film is formed of a high refractive material. 这些材料的折射率通常在1. 8以上。 Refractive index of these materials is normally above 1.8. 有各种各样的薄膜可用于本文。  There are a variety of thin films are useful herein. 非限制性实施例为Ti02、Fe203> SnO2, Cr2O3> ZnO, ZnS, ZnO, SnO、ZrO2, CaF2, BiOCl以及它们的混合物，或为分离层的形式，优选Ti02、Fe2O3^ Cr203、Sn02。 Non-limiting examples of Ti02, Fe203> SnO2, Cr2O3> ZnO, ZnS, ZnO, SnO, ZrO2, CaF2, BiOCl, and mixtures thereof, or in the form of separate layers, preferably Ti02, Fe2O3 ^ Cr203, Sn02. 对于多层结构，薄膜可由所有高折射率材料组成，或由具有高和低RI材料的薄膜交替组成，并以高RI薄膜作为顶层。 Multilayer structure, the film may be composed of all high refractive index materials, or a thin film with high and low RI materials with alternating composition, with the high RI film as the top layer. 干涉色是薄膜厚度的函数，对于具体颜色的厚度可随材料的不同而不同。  interference color is a function of film thickness, can be of different materials with different thickness for a specific color. 对TW2 而言，40nm至60nm厚度的层或该层的整数倍可给出银色，60nm至80nm厚度的层可给出黄色，80nm至IOOnm厚度的层可给出红色，IOOnm至130nm厚度的层可给出蓝色，130nm至160nm厚度的层可给出绿色。 For TW2, layer thickness of 60nm to 40nm or an integer multiple of the layer can be given a silver layer of a thickness of 60nm to 80nm yellow can be given, to the layer of 80nm thickness can be given IOOnm red, 130nm layer to a thickness IOOnm blue can be given, the thickness of the layer of 130nm to 160nm green can be given. 除了干涉色之外，其它透明的吸收颜料也可沉淀在TiO2层的顶部或与TW2层同时沉淀。 In addition to the interference color, other transparent absorption pigments can be precipitated on top of the TiO2 layer or a layer of precipitate at the same time TW2. 普通材料是红色或黑色氧化铁、亚铁氰化铁、氧化铬或胭脂红。 Common materials are red or black iron oxide, ferric ferrocyanide, chromium oxide or carmine. 已发现，除了干涉颜料的亮度之外，干涉颜料的颜色还在人对肤色的感觉方面具有显著的影响。 It has been found, in addition to outside interference pigment brightness, color is still human interference pigment has a significant impact on the terms of the feeling of skin color. 通常，优选的颜色是银色、金色、红色、绿色以及它们的组合。 In general, preferred colors are silver, gold, red, green, and combinations thereof. 、FLONAC ® 由Persperse，Inc.提供的那些；以商品名TIMIRON ®、C0L0R0NA ®、 DICHR0NA® 和XIR0NA® 由EMD Chemicals, Inc.提供的那些；以及以商品名FLAMENCO® 、TIMICA ®、DU0CHR0ME ® 由Engelhard Co.提供的那些。 Those FLONAC ® by the Persperse, Inc provided; tradename TIMIRON ®, C0L0R0NA ®, DICHR0NA® and XIR0NA® of EMD Chemicals, Inc. who provided; and the trade name FLAMENCO®, TIMICA ®, DU0CHR0ME ® by Engelhard those Co. provided. 在本发明的一个实施方案中，干涉颜料表面为疏水的或已被疏水改性的。  In one embodiment of the present invention, the interference pigment surface is either hydrophobic or has been hydrophobically modified. 疏水改性的干涉颜料或HMIP能够允许将HMIP夹在相内，并且能够使HMI P更多的沉积。 Hydrophobically modified interference pigment or HMIP can allow the entrapment of the HMIP within the phases and enables the HMI P more deposition. 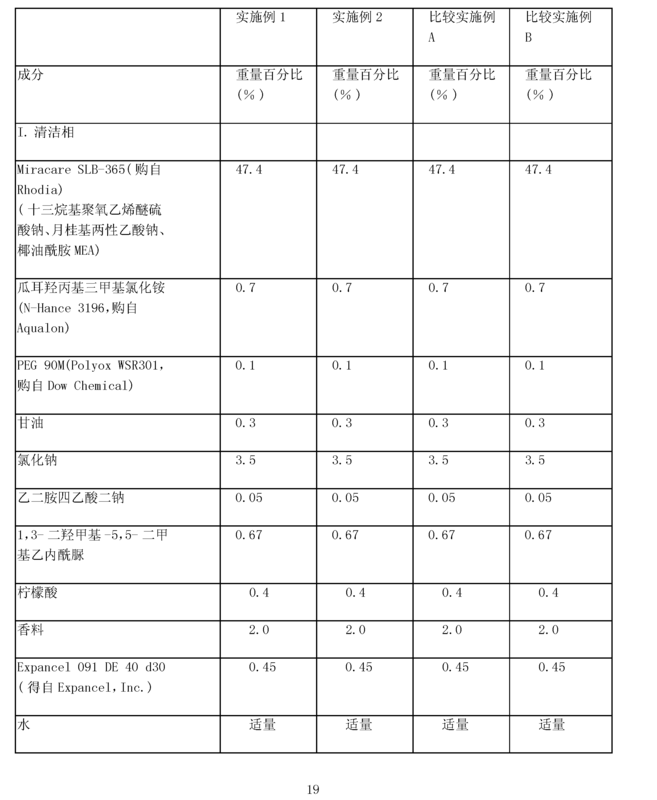 优选HMI P与相的比例为1 ： 1至约1 ： 70，更优选1 ： 2至约1 ： 50，还更优选1 ： 3至约1 ： 40， 并且最优选1 ： 7至约1 ： 35。 Ratio is preferably HMI P to a phase is 1: 1 to about 1: 70, more preferably 1: 2 to about 1:50, and still more preferably 1: 3 to about 1: 40, and most preferably 1: 7 to about 1: 35. 在本发明的一个实施方案中，优选在疏水组合物中夹带HMIP。  In one embodiment of the present invention are preferably entrapped within the hydrophobic composition HMIP. 这需要疏水组合物的粒度通常要大于HMIP。 This requires the hydrophobic composition particle size is generally larger than the HMIP. 在本发明的一个优选的实施方案中，每份疏水组合物颗粒仅包含少量的HMIP。 In a preferred embodiment of the present invention, per hydrophobic composition particles contain only small amounts of HMIP. 这优选小于20，更优选小于10，最优选小于5。 This is preferably less than 20, more preferably less than 10, most preferably less than 5. 这些参数，有益小滴与HMIP 的相对大小以及每份疏水组合物颗粒所含的HMIP颗粒近似数，可通过使用借助光学显微镜的目视检测来测定。 These parameters, useful HMIP particles and droplets and the relative size of HMIP particles per hydrophobic composition contained in the approximate number, can be determined by means of visual inspection using an optical microscope. 本发明HMIP具有的疏水性涂层的含量按所述总颗粒重量计优选为至少约0. 1%重量，更优选至少约0.5%重量，甚至更优选至少约重量。  The present invention has the content of HMIP hydrophobic coating of the total weight of the particles preferably is at least about 0.1% by weight, more preferably at least about 0.5% by weight, and even more preferably at least about weight. 可用于本文的疏水性表面处理的非限制性实施例包括硅氧烷、丙烯酸酯硅氧烷共聚物、丙烯酸酯聚合物、烷基硅烷、三异硬脂酸异丙氧钛酯、硬脂酸钠、肉豆蔻酸镁、全氟醇磷酸酯、全氟聚甲基异丙基醚、卵磷脂、卡洛巴蜡、聚乙烯、脱乙酰壳多糖、月桂酰赖氨酸、植物类脂提取物以及它们的混合物， 优选硅氧烷、硅烷和硬脂酸酯。 Non-limiting embodiments of the hydrophobic surface treatment useful herein include silicones, acrylate silicone copolymers, acrylate polymers, alkyl silane, isopropyl titanium triisostearate stearate sodium, magnesium myristate, perfluoroalcohol phosphate, perfluoropolymethyl isopropyl ether, lecithin, carnauba wax, polyethylene, chitosan, lauroyl lysine, plant lipid extracts and mixtures thereof, preferably, silicones, silanes and stearates. 表面处理机构包括US Cosmetics、KOBO Products Inc.和Cardrelnc.。 Surface treatment houses include US Cosmetics, KOBO Products Inc., and Cardrelnc ..
 多种合适的任选成分可用于所述多相个人护理组合物中。  A variety of suitable optional ingredients can be used in the multiphase personal care composition. 上述任选成分最典型地为那些被认可用于化妆品中并描述于参考书如“CTFACosmetic Ingredient Handbook”第二版(The Cosmetic, Toiletries, and Fragrance Association, Inc. 1988,1992)中的物质。 Such optional ingredients are most typically those materials approved for use in cosmetics and that are described in reference books such as "CTFACosmetic Ingredient Handbook", Second Edition (The Cosmetic, Toiletries, and Fragrance Association, Inc. 1988,1992) substances. 这些任选物质可被用于本发明组合物的任何方面中，包括如本文所述的每一相。 These optional materials can be used in any aspect of the compositions of the present invention, including each phase as described herein. 非限制性任选成分包括湿润剂和溶质。  Non-limiting optional ingredients include humectants and solutes. 可使用多种湿润剂和溶质，并且它们的含量按所述个人护理组合物的重量计为约0. 1<%至约50%，优选约0. 5%至约35%，更优选约2%至约20%。 Using a variety of wetting agents and solutes and their content by weight of the personal care composition, from about 0.1 <% to about 50%, preferably from about 0.5% to about 35%, more preferably about 2 % to about 20%. 优选的湿润剂是甘油。 A preferred humectant is glycerin. 醇酸和乙醇酸盐（例如铵盐和四烷基铵盐）；乳酸和乳酸盐（例如铵盐和四烷基铵盐）；多羟基醇，例如山梨醇、甘油、己三醇、丙二醇、己二醇等；聚乙二醇；糖和淀粉；糖和淀粉衍生物（例如烷氧基化葡萄糖）；泛醇（包括D-、L-和D，L-型）；吡咯烷酮羧酸；透明质酸；内酰胺单乙醇胺；乙酰胺单乙醇胺；脲；和具有以下通用结构的乙醇胺=(HOCH2CH2)xNHy，其中χ = 1至3，y = 0至2，并且x+y = 3 ；以及它们的混合物。 Alkyd and glycolate salts (e.g. ammonium and tetraalkylammonium salts); lactic acid and lactate salts (e.g. ammonium and tetraalkylammonium salts); polyhydric alcohols such as sorbitol, glycerin, hexanetriol, propylene glycol hexylene glycol; polyethylene glycol; sugars and starches; sugar and starch derivatives (e.g. alkoxylated glucose); panthenol (including D-, L- and D, L- form); pyrrolidone carboxylic acid; hyaluronic acid; lactam monoethanolamine; acetamide monoethanolamine; urea; and ethanolamine having the general structure = (HOCH2CH2) xNHy, where χ = 1 to 3, y = 0 to 2 and x + y = 3; and mixtures thereof. 最优选的多元醇选自甘油、聚氧丙烯（1)甘油和聚氧丙烯（3)甘油、山梨醇、丁二醇、丙二醇、蔗糖、脲和三乙醇胺。 The most preferred polyhydric alcohol is selected from glycerine, polyoxypropylene (1) glycerol and polyoxypropylene (3) glycerol, sorbitol, butylene glycol, propylene glycol, sucrose, urea and triethanol amine. (PEG14-M 还可称为Polyox WSR-205 和Polyox WSR ® Ν-3000，均得自Union Carbide)；以及PEG-90M，其中χ等于2且η具有约90，000的平均值(PEG-90M还可称为Polyox WSR ® -301，得自Union Carbide)。 (PEG14-M can also be referred Polyox WSR-205 and Polyox WSR ® Ν-3000, both available from Union Carbide); and PEG-90M, where χ equal to 2 and η (PEG-90M has an average value of about 90,000 also known as Polyox WSR ® -301, available from Union Carbide). 这些任选成分的其它非限制性实施例包括维生素及其衍生物（如抗坏血酸、维生素E、生育酚乙酸酯等）；防晒剂；增稠剂（例如，多元醇烷氧基酯，其可以商品名Crothix购自Croda)；用于维持清洁组合物抗微生物完整性的防腐剂；抗痤疮药物（间苯二酚、水杨酸等）；抗氧化剂；皮肤抚慰和康复剂，如芦荟提取物、尿囊素等；螯合剂和多价螯合剂；以及适用于化妆目的的试剂，如芳香剂、精油、皮肤增感剂、颜料、珠光剂（如云母和二氧化钛)、 色淀、着色剂等等（如丁香油、薄荷醇、樟脑、桉树油和丁子香酚）。  Other non-limiting examples of these optional ingredients include vitamins and derivatives thereof (e.g., ascorbic acid, vitamin E, tocopherol acetate and the like); sunscreens; thickening agents (e.g., polyol alkoxy ester , which may be available from Croda under the trade name Crothix); cleaning compositions for maintaining the integrity of the anti-microbial preservatives; anti-acne agents (resorcinol, salicylic acid and the like); antioxidants; skin soothing and healing agents, such as aloe vera extract, allantoin and the like; chelators and sequestrants; and agents suitable for cosmetic purposes, such as fragrances, essential oils, skin sensates, pigments, pearlescent agents (e.g., mica and titanium dioxide), lakes, colorants and the like (e.g., clove oil, menthol, camphor, eucalyptus oil, and eugenol). 使用超速离心法来测定结构化区域或不透明结构化区域的百分数，所述结构化区域或不透明结构化区域存在于含有表面活性剂组分的多相个人护理组合物中。  determined structured or opaque structured domain area percentage method using ultracentrifugation, the structured region or opaque structured domain is present in the multiphase personal care composition comprising a surfactant component. 所述方法涉及通过超速离心法将组合物分离成单独但可辨识的层。 The method involves ultracentrifugation composition separated into separate but distinguishable layers. 本发明多相个人护理组合物可具有多个可分辨层，例如非结构化的表面活性剂层，结构化的表面活性剂层，以及有益层。 Multiphase personal care compositions of the present invention can have multiple distinguishable layers, for example, unstructured surfactant layer, a structured surfactant layer, and a benefit layer. 首先，将约4克多相个人护理组合物分配到Beckman离心管（11 X 60mm)中。  First, about 4 grams of multi-phase personal care composition into Beckman Centrifuge Tube (11 X 60mm) in. 接着， 将离心管放入到超速离心机（Beckman L8-M型或等效物）中，并将超速离心机设置成以下条件:5235. 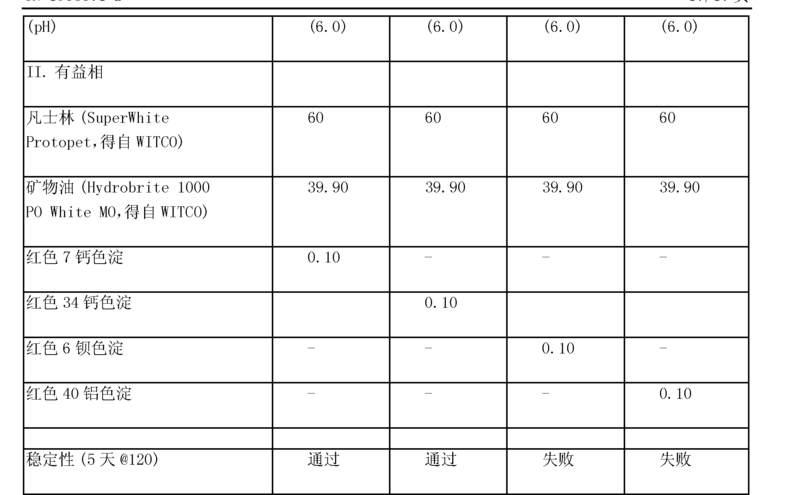 99rad/s (50，OOOrpm)、18 小时和25°C。 Next, place the centrifuge tubes in an Ultracentrifuge (Beckman L8-M or equivalent type), and the following conditions ultracentrifuge provided:. 5235 99rad / s (50, OOOrpm), 18 the hour and 25 ° C.
 结构化表面活性剂层组分可包含若干层或单个层。  The structured surfactant layer components may comprise several layers or a single layer. 超速离心后，在超速离心管的底层或次底层，通常是各向同性层。 After ultracentrifugation, the bottom or next to the bottom of the ultracentrifuge tube is generally an isotropic layer. 此澄清的各向同性层典型代表非结构化的胶束表面活性剂层。 Micellar surfactant layer This clear isotropic layer typically representative of unstructured. 位于各向同性相上方的层通常含有较高的表面活性剂浓度，同时具有较高的有序结构（如液晶）。 Located above the isotropic phase generally comprise higher layer of surfactant concentration, while with higher ordered structures (such as liquid crystal). 这些结构化层有时是肉眼不透明的或半透明的。 These structured layers are sometimes opaque to naked eyes, or translucent. 通常在结构化层和非结构化各向同性层之间有明显的相界。 Is generally a distinct phase boundary between the structured layer and the non-structured isotropic layer. 结构化表面活性剂层的物理性质可通过显微镜，在偏振光下测定。 Physical properties of the structured surface of the active agent layer may be measured by a microscope under polarized light. 结构化表面活性剂层在偏振光下典型显示具有独特的结构。 Structured surfactant layer display typically under polarized light has a unique structure. 表现结构化表面活性剂层特性的另一种方法是使用X-射线衍射技术。 Another method of performance characteristics of the structured resist layer is to use surfactants X- ray diffraction techniques. 结构化表面活性剂层显示出多条谱线，这通常主要是与液晶结构的长间距有关。 Structured surfactant layer display multiple lines, which are often associated primarily with the long spacings of the liquid crystal structure. 如果不含有益相，则以总高度作为表面活性剂层高度，Hs = Ha。  If no benefit phase present, use the total height as the surfactant layer height, Hs = Ha. 所述超速离心法可用于在49°C (120 °F )快速熟化期间测定清洁相的稳定性。  The stability of the ultracentrifugation method can be used during the cleaning phase is measured 49 ° C (120 ° F) rapid cure. 在快速熟化进行之前和之后测定结构化区域体积比率。 Before and after the assay for rapid curing structured domain volume ratio. 本发明中的多相组合物保持优良的相稳定性，在49°C (120 0F )下5天之后，结构化表面活性剂层的降解小于10%。 In the present invention the heterophasic composition maintains excellent phase stability at 49 ° C after (120 0F) for 5 days, structural degradation of the surface active agent layer is less than 10%. 比较实施例在快速熟化进行之后是不稳定的。 Comparative Example 1 following for rapid curing is unstable. 一些比较实施例显示有不同的相移（即，在结构化表面活性剂域顶部有新的相形成）。 Some Comparative Examples show different embodiments of a phase shift (i.e., the new phase is formed on top of the structured surfactant domain). 优选将本发明多相个人护理组合物局部涂敷到皮肤或毛发的所需区域，涂敷量足以向所涂敷的表面提供皮肤清洁剂、疏水性物质和颗粒的有效递送。  Preferred multiphase personal care composition of the present invention is applied topically to the desired area of ​​the skin or hair, an amount sufficient to provide effective delivery of the skin cleansing agent, hydrophobic material and particles to the applied surface. 所述组合物可直接涂敷到皮肤上，或通过使用清洁粉扑、毛巾、海绵或其它工具间接地涂敷到皮肤上。 The composition may be applied directly to the skin, or through the use of a cleansing puff, washcloth, sponge or other implement indirectly applied to the skin. 在局部涂敷之前、期间或之后，优选用水稀释所述组合物，接着用水或与水组合的水不溶性基质冲洗或擦拭，优选冲洗涂敷表面的皮肤或毛发。 Topical application before, during, or after diluting the composition is preferably water, followed by water, or water in combination with water-insoluble base rinsed or wiped off, preferably rinsed off of the applied surface of the skin or hair. 因此，本发明还涉及经由本发明组合物的上述涂敷来清洁皮肤的方法。  Accordingly, the present invention also relates to the coating composition by the present invention is a method of cleansing the skin. 本发明方法还涉及经由本发明组合物的上述涂敷，向所涂敷的表面提供所需皮肤活性剂的有效递送，以及提供由本文所述有效递送获得的有益效果的方法。 The present invention further relates to a method of providing effective delivery of the desired skin active agent to the coated surface via the coating composition of the present invention, by a method described herein, as well as providing efficient delivery of the beneficial effects obtained. 优选地，所述方法涉及向皮肤或毛发递送皮肤有益效果，所述方法包括下列步骤：将有效量的依照本发明多相个人护理组合物的多相个人护理组合物分配到工具上，所述工具选自清洁粉扑、毛巾、海绵和人的手； 使用所述工具，将所述组合物局部涂敷到所述皮肤或毛发上；并且通过漂洗所述皮肤和毛发，将所述组合物从所述毛发或皮肤上除去。 Preferably, the method involves delivering skin benefits to skin or hair, said method comprising the steps of: administering an effective amount of a multiphase personal care composition in accordance with the multiphase personal care compositions of the present invention is assigned to the tool, the tool selected cleansing puff, washcloth, sponge and human hand; the use of the tool, the composition is topically applied to the skin or hair; and the skin and hair by rinsing the composition from removing the hair or the skin. 所述多相个人护理组合物可通过任何已知的或其它有效的适于制备和配制所需多相产品形式的技术来制得。  The multiphase personal care composition can be prepared the desired multiphase product form by any known techniques or other effective technique, suitable for making and formulating. 将牙膏管填充技术与旋转台设计结合是有效的。 The combine toothpaste-tube filling technology with a spinning stage design is effective. 此外，本发明还可用US 6，213，166中所公开的方法和设备来制备。 Further, the present invention can be prepared using the methods and apparatus disclosed in US 6,213,166. 所述方法和设备使两个或多个组合物可以螺旋形构型填充到单个容器中。 The method and apparatus of the two or more compositions may be a spiral configuration into a single container is filled. 该方法需要使用至少两个喷嘴来填充容器。 The method requires that at least two nozzles for filling the container. 容器放在静态混合器中，当组合物被引入容器中时旋转该容器。 Container is placed in a static mixer, rotating the container when the composition is introduced into the vessel. 可供选择地，通过首先将分离的组合物置于连有泵和软管的分离储槽中来混合至少两相也是有效的。  Alternatively, by first separating composition was placed in a pump and a hose attached to the reservoir separating at least two phases are mixed it is also effective. 然后，以预定量将所述相泵送到单独的混合区域中。 Then, a predetermined amount of the pumped single-phase mixed region. 接着，使所述相从混合区域移至共混区域，并在共混区域混合所述相，使得单一的所得产物显示具有不同的所述相图案。 Subsequently, the phases are moved from the mixed region blended region, and the phase mixed in the blending section such that the single resulting product exhibits a distinct pattern of the phases. 所述图案选自条纹状、大理石纹状、几何状、以及它们的组合。 The pattern is selected from striped, marbled, geometric, and combinations thereof. 下一步涉及将在共混区域混合好的产物通过软管泵送到单个喷嘴中，然后将喷嘴放置到容器中，并用所得产物填充容器。 The next step involves the product that was mixed in the blending section via a hose into a single nozzle of the pump, and then placing the nozzle into a container and filing the container with the resulting product. 应用于本发明具体实施方案中的上述方法的具体非限制性实施例描述于以下实施例中。 Specific non-limiting examples of specific embodiments of the methods described above applied to the embodiment of the present invention are described in the following examples. 如果所述多相个人护理组合物包含各种颜色的图案，则需要将这些组合物包装在透明或半透明的包装中，以使消费者可透过包装看到图案。  If the multiphase personal care composition comprises a pattern of various colors, it is necessary these compositions packaged in transparent or translucent package, so that the consumer can view the pattern through the package. 由于主题组合物的粘度，还需要包括消费者使用说明，以将包装倒置于其盖子上储存，以有利于分配。 Since the viscosity of the subject compositions, also we need to include instructions to the consumer to store the package upside down, on its cap to facilitate dispensing. 应当理解，在本说明书中给出的每一上限值包括每一个下限值，即如同该下限值在本文中也有明确的表示。  It should be understood that every given throughout this specification includes every lower upper limit value, i.e., as the lower limit value is also herein expressly written. 本说明书全文中给出的所有下限值均包括所有上限值，即如同上述上限值在本文中也有明确的表示。 Every minimum numerical limitation given throughout this specification includes every higher numerical limitation, as the upper limit value is also herein expressly written. 本说明书全文中给出的所有数值域均包括所有属于上述较宽数值域的较窄数值域，即如同上述较窄数值域在本文中也有明确的表示。 Every numerical range given throughout this specification includes every narrower numerical range that falls within such broader numerical range, as if such narrower numerical ranges herein are also expressly written. 除非另外指明，本文说明书、实施例和权利要求书中的所有份数、比例和百分数均按重量计，并且所有数值范围均使用本领域给出的常规精确度。  Unless otherwise indicated, the description herein, all parts of the book embodiment examples and claims, proportions and percentages are by weight and all numerical limits are used with the conventional art given degree of accuracy. 下列实施例进一步描述和举例说明了本发明范围内的实施方案。  The following examples further describe and illustrate embodiments within the scope of the present invention. 所给的这些实施例仅仅是说明性的，不可理解为是对本发明的限制，因为在不背离本发明的精神和保护范围的情况下可以进行许多改变。 These examples given are merely illustrative, and not to be construed as limitations of the present invention, as many variations may be made without departing from the spirit and scope of the present invention. 以下的每个实施例都是多相个人护理组合物，所述组合物包含按所述个人护理组合物的重量计50%的第一相和按所述个人护理组合物的重量计50%的第二相。  each of the following examples are multiphase personal care composition, said composition comprising by weight 50% by weight of the personal care composition and a first phase of the personal care composition 50% of a second phase. 特定相中每个组分的量是以基于包含该组分的特定相重量的重量百分比形式给出。 The particular amount of each component phase is in the form given in weight percent based on the weight of the particular phase that contains the component. 当对其中包含含有钡和/或铝的着色剂的多相个人护理组合物与其中包含基本上不含钡和/或铝的着色剂的多相个人护理组合物进行比较时，下列比较实施例表明了有多少不透明的结构化热力学域已经被破坏。  When the multiphase personal care compositions which comprise containing barium and / or aluminum colorant contained therein is substantially free of barium and / or aluminum colorant multiphase personal care composition are compared, the following Comparative examples show how many thermodynamic opaque structured domain has been destroyed. 描述于表1中的下列实施例是本发明多相个人护理组合物的非限制性实施例。  Table 1 is described in the following examples are non-limiting embodiment of the present invention, the multiphase personal care composition. 可通过常规的制剂和混合技术制备上述多相个人护理组合物。  can be prepared by the above-described multiphase personal care composition by conventional formulation and mixing techniques. 通过首先将柠檬酸以1 ： 3比率加入到水中形成柠檬酸预混物，来制备清洁相组合物。 1 by first adding citric acid: 3 ratio was added to water to form a citric acid premix, was prepared with the cleaning composition. 将Polyox WSR 301以1 ： 3的比率分散到甘油中以形成Polyox预混物。 Polyox WSR 301 will be a 1: 3 ratio to form a dispersed glycerin Polyox premix. 将聚合物N-Hance以1 ： 10的比率分散到水中以形成N-Hance预混物。 N-Hance polymer ratio of 1: 10 to water to form a dispersion of N-Hance premix. 然后，按以下顺序，将以下成分加入到主混合容器中：水、 N-Hance预混物、Polyox预混物、柠檬酸预混物和Expancel。 Then, in the following order, the following ingredients into the main mixing vessel: water, N-Hance premix, as Polyox premix, citric acid premix, and Expancel. 启动混合容器的搅拌。 Start agitation of the mixing vessel. 然后， 加入Miracare SLB-365、氯化钠、苯甲酸钠、乙二胺四乙酸二钠、1，3- 二羟甲基-5，5- 二甲基乙内酰脲和香料。 Then, Miracare SLB-365, sodium chloride, sodium benzoate, Disodium EDTA, 1,3-dimethylol-5,5 dimethyl hydantoin and perfumes. 持续搅拌，直至形成均一化的溶液。 Stirring was continued until a homogenous solution is formed. 通过首先将着色剂以1 ： 10的比率分散在Hydrobrite 1000白矿油中以制备有益相。  By first colorant ratio of 1: 10 was dispersed in white mineral oil Hydrobrite 1000 to prepare a benefit phase. 使用高剪切搅拌器将预混物混合均勻。 Using a high shear mixer premix mixed. 将SuperWhite ftOtopet凡士林加进混合容器中。 SuperWhite ftOtopet add the petrolatum in a mixing vessel. 将容器加热至88°C (190 0F )。 The vessel was heated to 88 ° C (190 0F). 然后，在搅拌下将Hydrobrite 1000白矿油和着色剂预混物加进混合容器中。 Then, under stirring Hydrobrite 1000 White mineral oil and colorant premix is ​​added to the mixing vessel. 缓慢搅拌下，使容器冷却。 Under slow stirring the vessel was cooled. 将清洁相和有益相在50 ： 50w/w比率下共混合，并且在49°C (120 °F )储存5天。 The cleansing phase and benefit phase at 50: the 50w / w ratios were mixed and stored at 49 ° C (120 ° F) 5 days. 然后，在25°C下以5235. 99rad/s (50, OOOrpm)的速率将所述组合物超高速离心18 小时。  Then, at 25 ° C for at 5235. 99rad / s (50, OOOrpm) the combined rate of ultracentrifuge for 18 hours. 在超高速离心后，测定结构化区域体积比率。 After ultracentrifugation, structured domain volume ratio assay. 实施例1和2在49°C (120 °F )下5 天之后，以< 10%的结构化相降解通过了相稳定性测试。 Examples 1 and 2 at 49 ° C (120 ° F) after 5 days structured <degraded by 10% relative to the phase stability test. 比较实施例A和B以> 10%的结构化相降解没通过相稳定性测试。 Comparative Examples A and B were> 10% structured phase degradation failed the stability test phase. 发明详述中引用的所有文献的相关部分均引入本文以供参考；任何文献的引用都不可解释为是对其作为本发明现有技术的认可。 All documents relevant part of the  DETAILED DESCRIPTION cited are incorporated herein by reference; the citation of any document is not to be construed as an admission that it is prior art to the present invention. 尽管已用具体实施方案来说明和描述了本发明，但对于本领域的技术人员显而易见的是，在不背离本发明的精神和保护范围的情况下可作出许多其它的变化和修改。  While particular embodiments illustrated and described in the present invention, but those skilled in the art will be apparent that may be made by various other changes and modifications without departing from the spirit and scope of the present invention. 因此有意识地在附加的权利要求书中包括属于本发明范围内的所有这些变化和修改。 Therefore intended to cover in the appended claims include all such changes and modifications belong to the scope of the invention. 1. 一种多相个人护理组合物，所述组合物包含： 至少两个视觉上不同的相；其中至少一个视觉上不同的相包含清洁相，所述清洁相包含结构化区域，其中所述结构化区域是不透明的结构化区域，所述不透明的结构化区域为层状相，和其中所述清洁相包含：(i)至少一种阴离子表面活性剂； (ϋ)至少一种电解质；(iii)至少一种链烷醇酰胺；和(iv)水；其中所述清洁相是非牛顿剪切致稀的；和所述清洁相在25°C具有等于或大于3000cps的粘度； 其中至少另一个视觉上不同的相包含有益相； 其中至少一个视觉上不同的相包含着色剂；其中所述着色剂选自D&C红30滑石色淀、D&C红7钙色淀、D&C红34钙色淀、红30低铁、色淀27与色淀30的D&C红色淀共混物、FD&C黄5色淀、Kowet 二氧化钛、黄色氧化铁、 D&C红30色淀、D&C红28色淀、Cos红氧化物BC、Cos氧化铁红BC、Cos氧化铁黑BC、Cos 氧 1. A multi-phase personal care composition, said composition comprising: at least two visually distinct phases; wherein at least one visually distinct phase comprises a cleansing phase, of said cleansing phase comprises a structured domain, wherein said structured domain is an opaque structured domain, said opaque structured domain is a lamellar phase, and wherein the cleansing phase comprises: (i) at least one anionic surfactant; (ϋ) at least one electrolyte; ( iii) at least one alkanolamide; and (iv) water; wherein the cleansing phase is non-Newtonian shear thinning; and the cleansing phase has a viscosity of equal to or greater than 3000cps at 25 ° C; wherein at least another visually distinct phase comprises a benefit phase; wherein at least one visually distinct phase comprises a colorant; wherein the colorant is selected from D & C red 30 talc lake, D & C red 7 calcium lake, D & C red 34 calcium lake, red 30 low iron, lake 27 and the lake D & C red lake blend 30, FD & C yellow 5 lake, Kowet titanium dioxide, yellow iron oxide, D & C red 30 lake, D & C red 28 lake, Cos red oxide the BC, Cos iron oxide red BC, Cos iron oxide black BC, Cos oxygen 铁黄、Cos 氧化铁褐、Cos 氧化铁黄BC、Euroxide 红Unsteri 1、Euroxide 黑Unsteri 1、 Euroxide 黄Steril、Euroxide 黑Steril、Euroxide 红、Euroxide 黑、疏水Euroxide 黑、疏水Euroxide黄、疏水Euroxide红、D&C黄6色淀、D&C黄5锆色淀，以及这些着色剂的混合物；其中所述相以彼此直接接触的方式包装；和其中所述视觉上不同的相在120° F稳定5天。 Yellow iron oxide, Cos Iron Oxide Brown, Cos Iron Oxide Yellow the BC, Euroxide Red Unsteri 1, Euroxide Black Unsteri 1, Euroxide yellow. Steril., Euroxide Black. Steril., Euroxide Red, Euroxide Black, Hydrophobic Euroxide Black, Hydrophobic Euroxide Yellow, Hydrophobic Euroxide Red, D & C yellow 6 lake, D & C yellow 5 zirconium lake, and mixtures of these colorants; wherein said phase in direct contact with each other packaged; and said visually wherein different phases 120 ° F stable for 5 days. 2.如权利要求1所述的多相个人护理组合物，所述组合物包含按所述组合物的重量计0. 00001%至10%的所述着色剂。 2. The multi-phase personal care composition according to claim 1, said composition comprising said colorant by weight of the composition, 0.00001 to 10% of. 3.如权利要求1所述的多相个人护理组合物，其中所述有益相包含疏水组合物；其中所述疏水组合物包含按所述有益相的重量计20 %至100 %的疏水组分。 3. The multiphase personal care composition according to claim 1, wherein said benefit phase comprises a hydrophobic composition; wherein said hydrophobic composition comprises by weight of the benefit phase is from 20% to 100% of the hydrophobic component . 4.如权利要求1所述的多相个人护理组合物，其中所述视觉上不同的相形成图案。 4. The multi-phase personal care composition according to claim 1, wherein said visually distinct phases form a pattern. 5.如权利要求4所述的多相个人护理组合物，其中所述图案选自条纹状、几何状、大理石纹状以及它们的组合。 5. The multi-phase personal care composition according to claim 4, wherein said pattern is selected from striped, geometric, marbled, and combinations thereof. 6.如权利要求1所述的多相个人护理组合物，其中所述组合物还包含护肤活性物质， 所述护肤活性物质选自维生素及其衍生物；防晒剂；防腐剂；抗痤疮药物；抗氧化剂；皮肤抚慰和愈合剂；螯合剂；精油；皮肤增感剂以及它们的混合物。 6. The multi-phase personal care composition according to claim 1, wherein said composition further comprises a skin care active, the skin care active is selected from vitamins and derivatives thereof; sunscreens; preservatives; anti-acne drugs; antioxidants; skin soothing and healing agents; chelating agents; essential oils; skin sensates, and mixtures thereof. 7.如权利要求6所述的多相个人护理组合物，其中所述护肤活性物质选自多价螯合剂。 7. The multi-phase personal care composition according to claim 6, wherein said skin care active is selected from a sequestering agent. 8.如权利要求1所述的多相个人护理组合物，其中至少一相包含颗粒。 8. The multi-phase personal care composition according to claim 1, wherein the at least one phase comprises particles. 9. 一种向皮肤或毛发递送皮肤有益效果的非治疗性方法，所述方法包括下列步骤：a)将有效量的如权利要求1所述的多相个人护理组合物分配到工具上，所述工具选自清洁粉扑、毛巾、海绵和人的手；b)使用所述工具将所述组合物局部涂敷到所述皮肤或毛发上；和c)通过用水漂洗所述皮肤或毛发，将所述组合物从所述皮肤或毛发上除去。 A non-therapeutic method of delivering skin benefits to the skin or hair, said method comprising the steps of: a) multi-phase personal care composition of claim 1 as an effective amount of a claimed in claim assigned to the tool, the said tool is selected from a cleansing puff, washcloth, sponge and human hand; b) using the tool of the composition is topically applied to the skin or hair; and c) rinsing said hair or skin with water, will removing said composition from said skin or hair. ES2203630T3 (en) 2004-04-16 Shampoo composition.